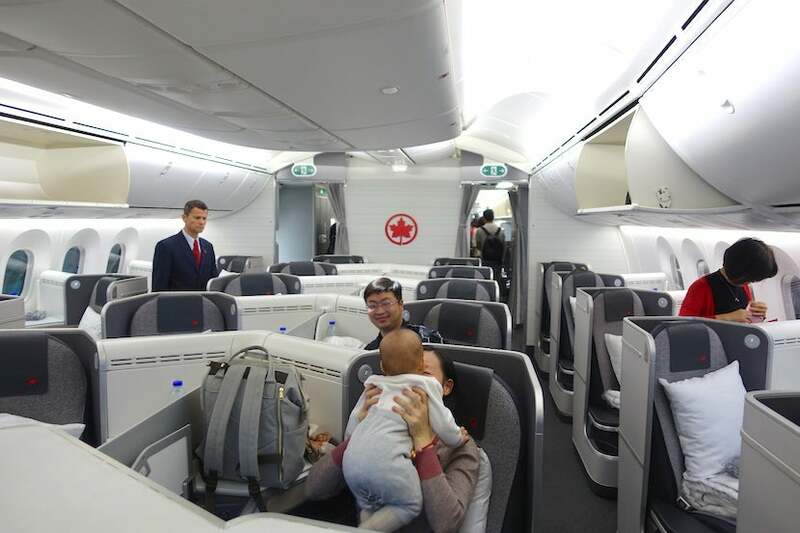 A recent trip from Canada to China presented the opportunity to fly in Air Canada’s 787-8 Dreamliner business-class product. The Pros: Comfortable seats and friendly service. The Cons: Lackluster amenities and no Wi-Fi. 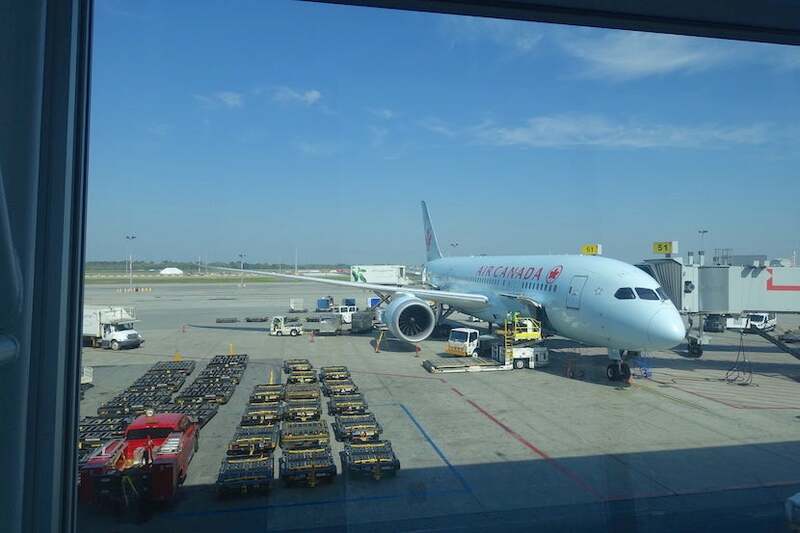 I tend to fly directly to or from the US on international trips, so I often overlook Air Canada as a possibility when searching for my ticket. 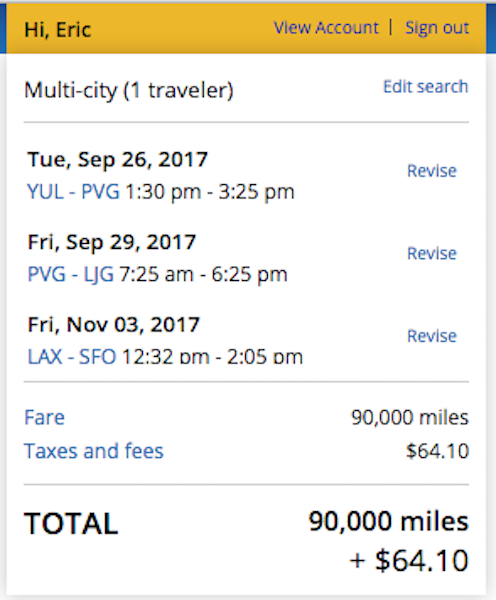 That’s not to say I don’t look for awards through its Aeroplan mileage program, which can sometimes present great value despite the sometimes high carrier-imposed fees, change fees and the occasional (but major) devaluation — it’s a great way to search for Star Alliance award availability, for instance. 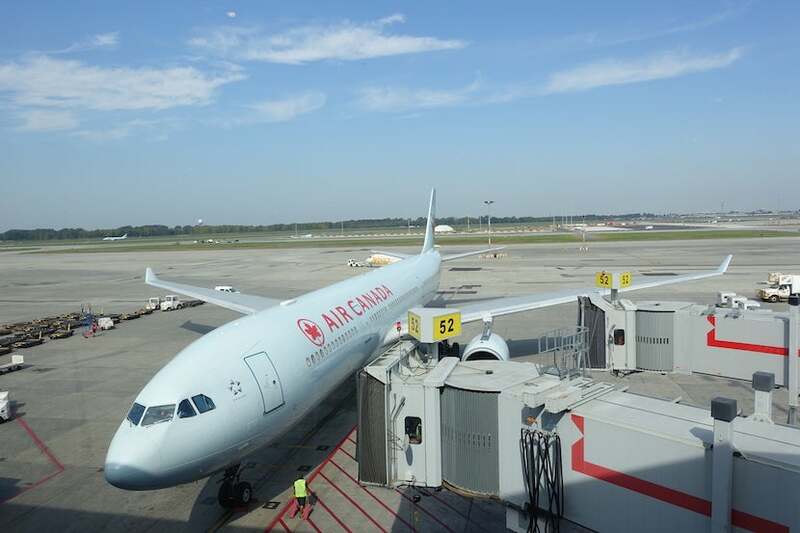 Since Air Canada eventually plans to start its own independent mileage program and end its partnership with Aeroplan in 2020, now is a good time to try to maximize it for Air Canada or Star Alliance awards — while you still can. When it comes to actually flying, I usually look at other options for getting to Europe, Asia or the South Pacific. 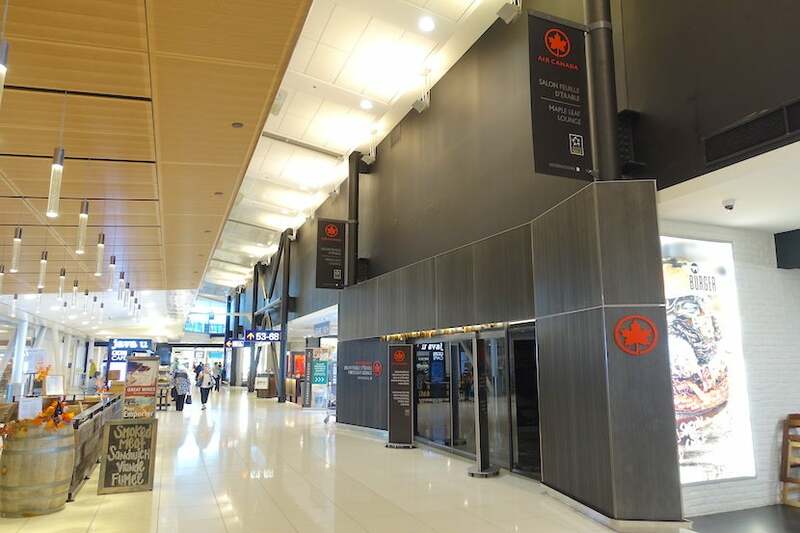 Due to some overlapping travel plans, however, I needed to find a way to travel from Montreal to China, and Air Canada ended up being the right choice for me, along with some connecting flights on its Star Alliance partner, Shenzhen Airlines. 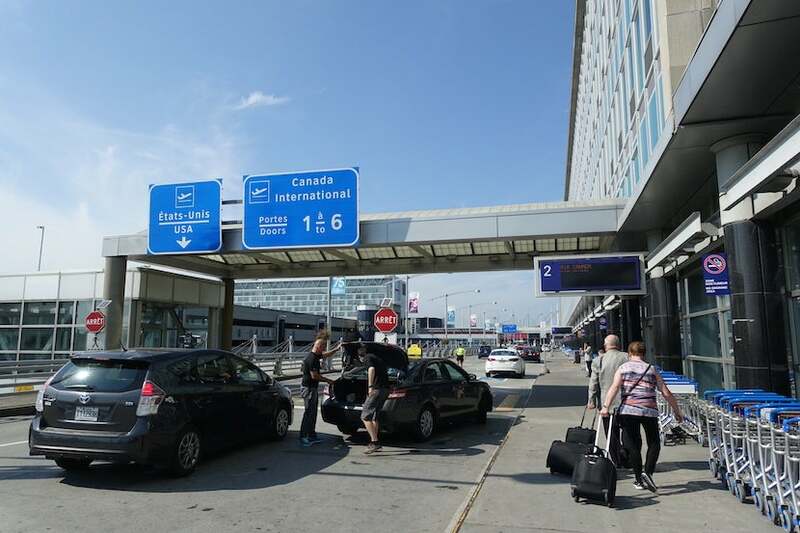 I needed to get from Montreal (YUL) to a little airport in Mainland China called Lijiang (LJG). Because Air Canada, Air China and Shenzhen Airlines are all part of the Star Alliance, I started looking for award possibilities by searching on United.com. To my surprise, I found a lot of possibilities right off the bat — they all involved an overnight layover in Beijing, Shanghai or Shenzhen, but that didn’t bother me. 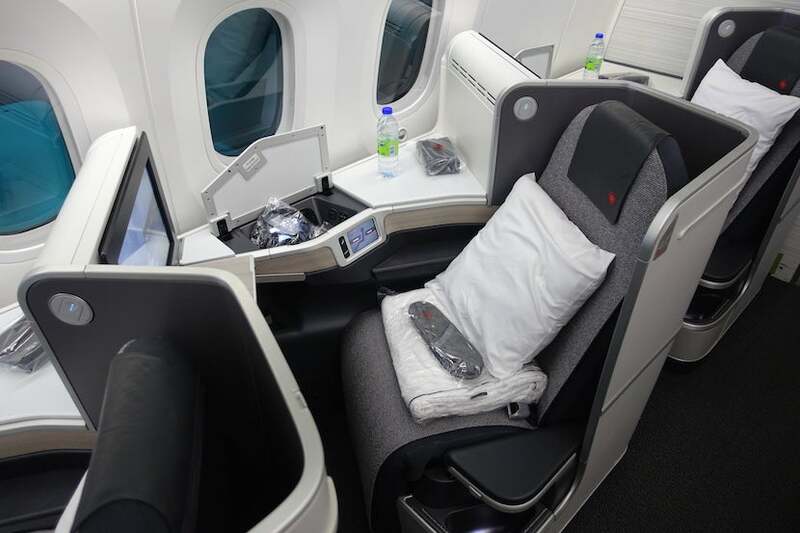 I could fly from Montreal to Chicago (ORD), Newark (EWR) or Washington Dulles (IAD) on regional jets, then on to Beijing aboard 777-200s with United’s old business class seats and new Polaris amenities, but then I’d have to continue on Air China. 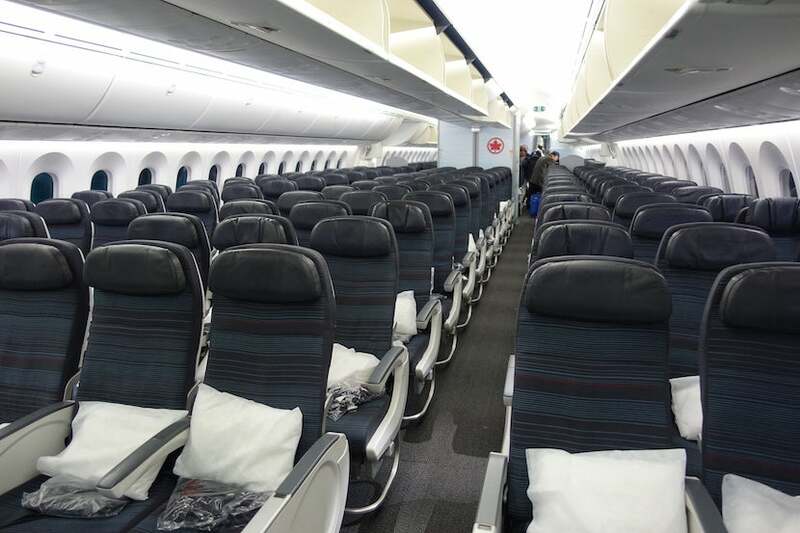 I could have also flown on Air China’s 777 or 747-8 to Beijing from Montreal or via New York, but was not super interested in doing so since its business-class seats feel outdated at this point. Finally, I could fly to Europe on either Air Canada, Lufthansa or SWISS, then on Air China, but that seemed too far out of my way. 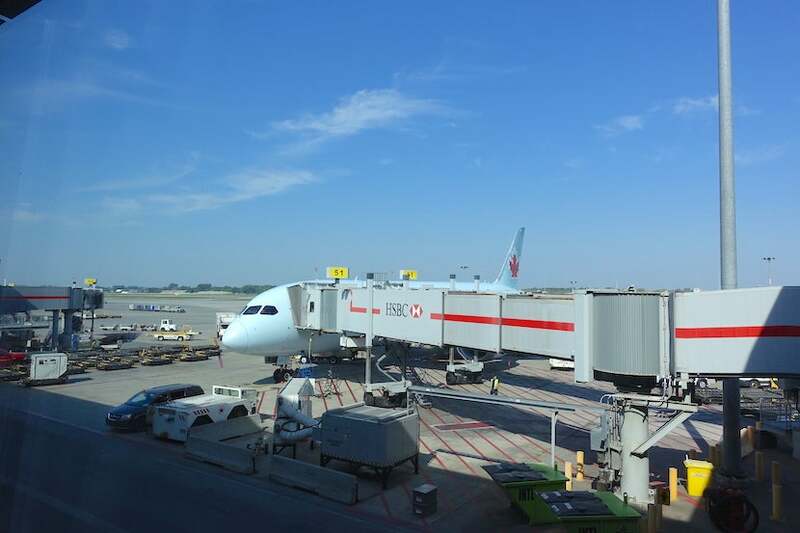 In the end, I settled on an itinerary that would have me flying nonstop from Montreal to Shanghai (PVG) aboard Air Canada’s 787-8, having a few hours to kill, and flying to Shenzhen (SZX) aboard Shenzhen Airlines with an overnight in the city. My final two-hour leg to Lijiang would also be aboard Shenzhen, but in coach. 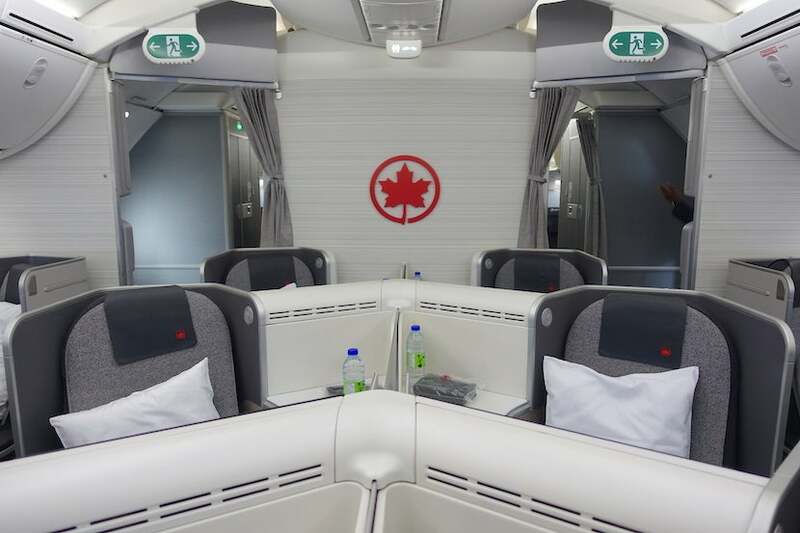 That way, I’d get a chance to check out Air Canada’s latest business-class product — which beats United and Air China’s outdated seats — and could rest up overnight in Shenzhen before the main portion of my trip began. Interestingly enough, no Montreal routes are listed on Air Canada’s dedicated 787 webpage, but as it says, routes are subject to change — and Seoul is apparently closer to Brisbane than Tokyo. 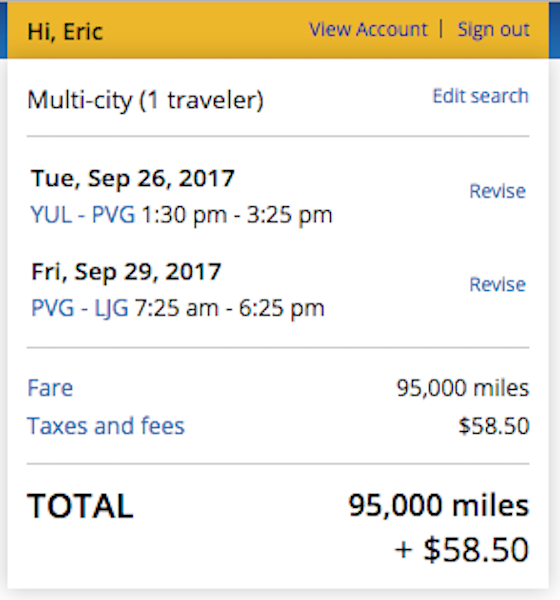 My two main mileage options for such an itinerary were either to pay 80,000 United MileagePlus miles plus $58 in taxes and fees, or 75,000 Aeroplan miles plus CAD$373 (~$305) in taxes and fees, as shown in the sample itinerary, below. Unfortunately, I didn’t have enough American Express Membership Rewards points to transfer to Aeroplan for that redemption and I like to save my Starwood Preferred Guest points, which also transfer to Aeroplan, for more valuable hotel redemptions. I do, however, have a stash of Chase Ultimate Rewards points, which transfer instantly at a 1:1 ratio to United MileagePlus. Though I’d need 5,000 more points with this option, it would save me about $250 — a value of 5 cents per Ultimate Rewards point, so that’s what I ended up doing. I used my Chase Sapphire Reserve Card to pay the taxes and fees so I’d earn an extra 3x points per dollar on those. 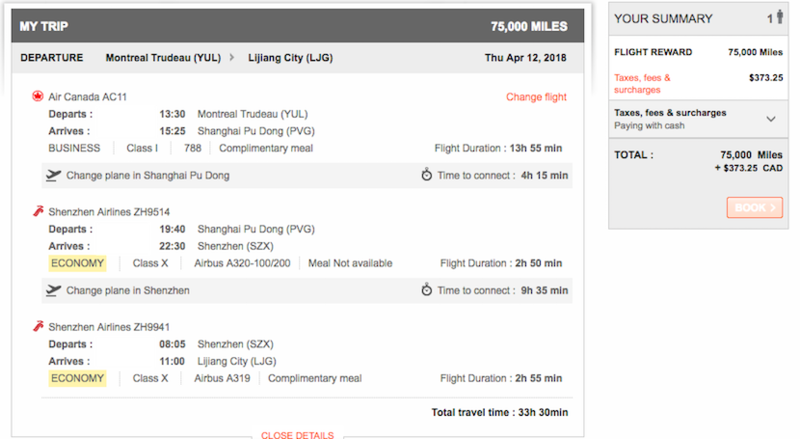 Just out of curiosity, I looked up what a comparable ticket purchased from Air Canada — including travel on Juneyao as well as Shenzhen Airlines — would have cost, and it came to CAD$6,385 (~$5,210), which seems astronomical. 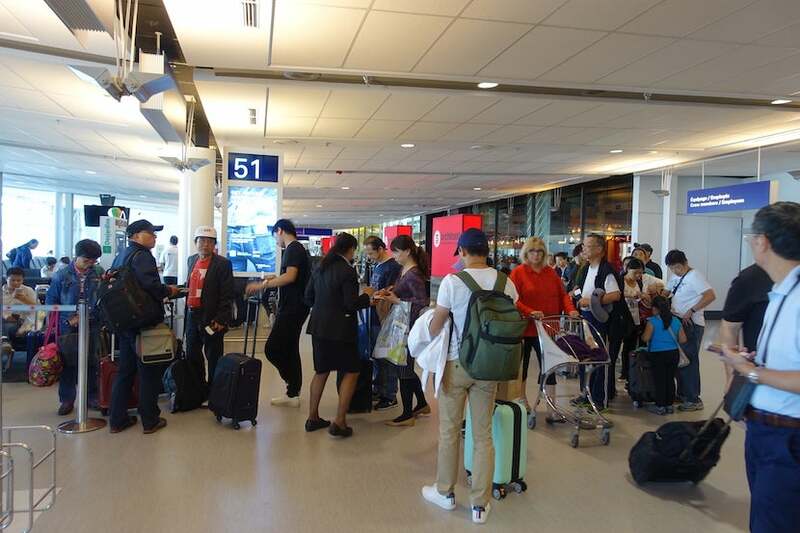 Just flying to Shanghai would have been closer to $3,000-$4,000 while round-trip tickets between Montreal and Shanghai were also in the $4,000-$6,000 range. Just after I confirmed my booking, the message below popped up on United.com. There had been a schedule change for my third flight that the search engine hadn’t seen for some reason, but that the booking engine had flagged. I looked at the new times, and they suited me better since they would get me to my final destination even earlier than the itinerary I’d found. When I got my e-ticket, it contained the new times. 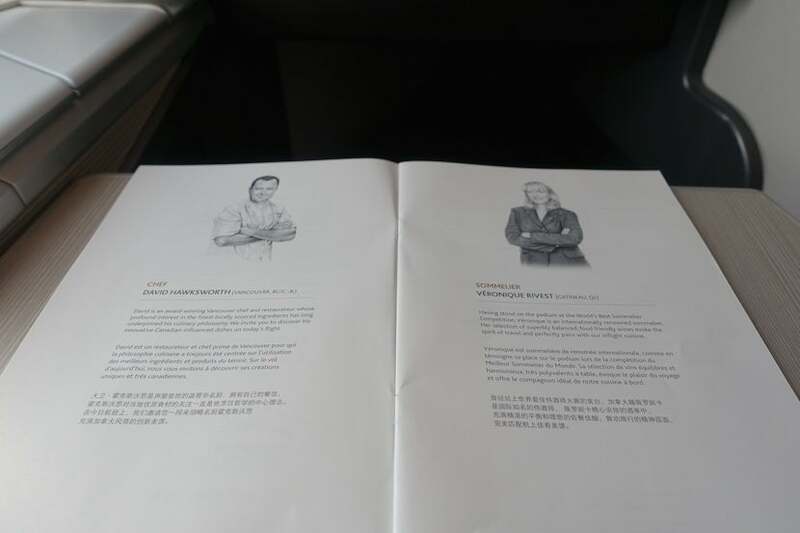 One other final consideration I had was whether to try to incorporate United’s new routing rules and Excursionist perk into my itinerary so I could have a multi-day stopover in Shanghai on my way to Lijiang without spending too many more miles. If I were to book a multi-city award with my flight to Shanghai, spend a few days there, then continue to Lijiang, United would book it out as two separate awards at a cost of 95,000 miles. However, due to the byzantine rules of the Excursionist perk, if I tagged on a random segment back in North America for a flight I needed to take at a later date anyway, I’d only be charged 90,000 miles total and would still get my stopover. That would have taken some work and sorting out plans well in the future, though, so in the end, I decided to keep my original itinerary to Lijiang. 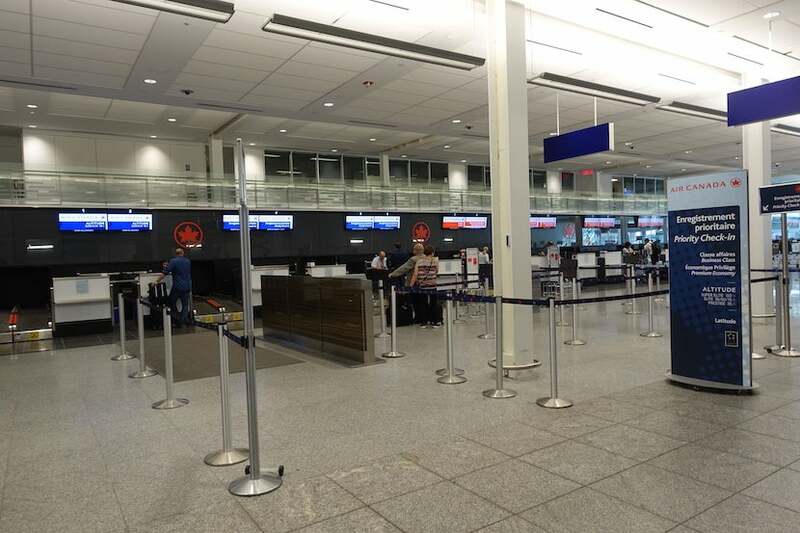 My flight didn’t leave Montreal until 1:30pm, but I wanted to spend some time exploring the airport and make sure I could check my bag through to Shenzhen instead of all the way to Lijiang, so I got to YUL at 11:30am. 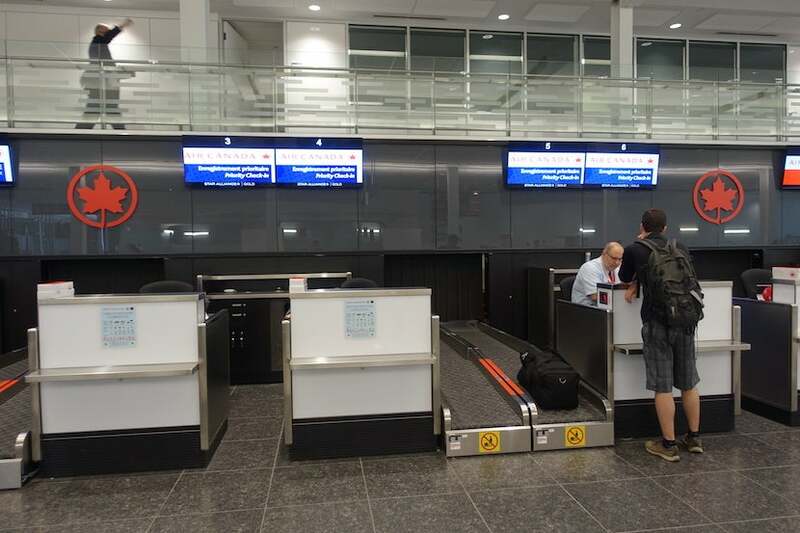 There were very few people in the non-US international flight check-in area, and I made a beeline for the back section where the priority desks were. The two agents working there each had a passenger at the time, though no one else was waiting. 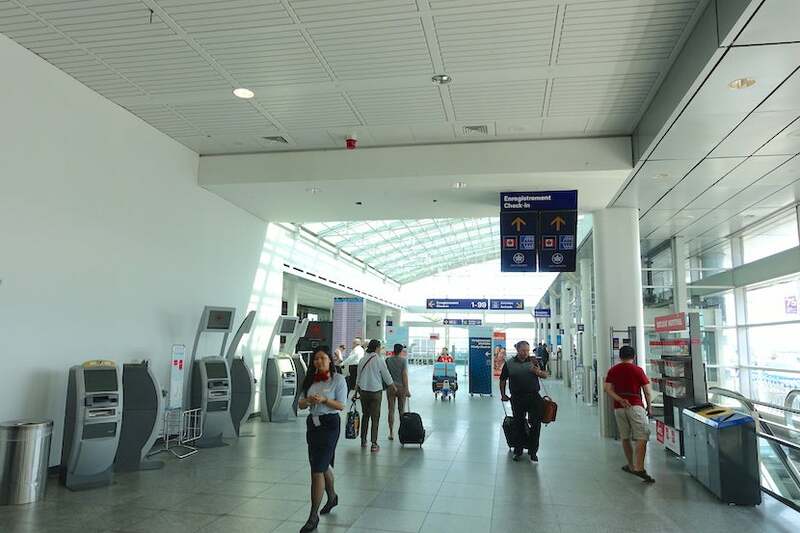 One of the agents checked me in within about two minutes, adding that I’d need to collect my checked bag in Shanghai and re-check it before continuing. 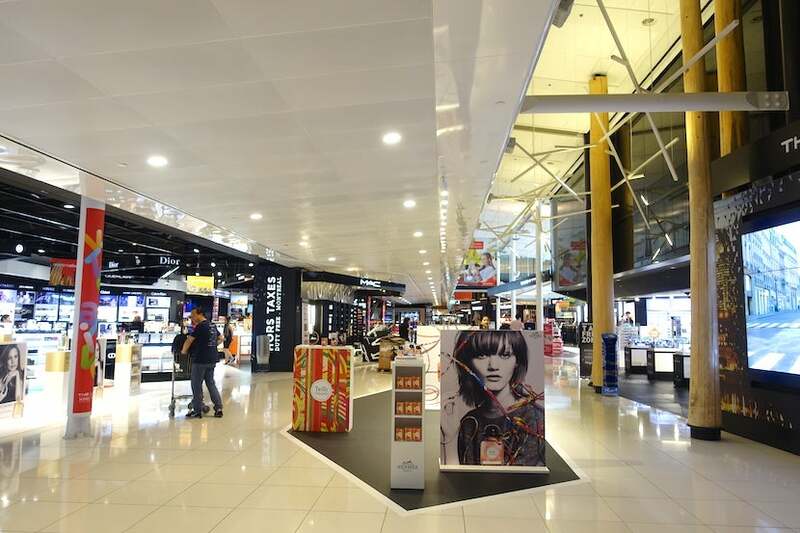 Like me, she was confused as to why that was, and looked into it for me — it seemed to be an issue with Chinese authorities rather than their interline agreement with Shenzhen Airlines — before handing my boarding passes over and directing me to the lounge. 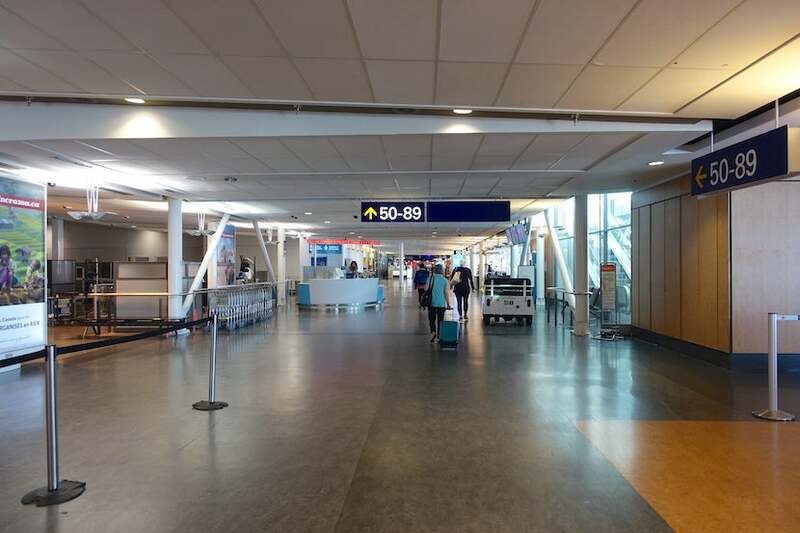 Very few other flights seemed to be departing around the same time as my own, so security was empty. I had access to the priority lane with no one else in it, and it took about 90 seconds for me to get through. 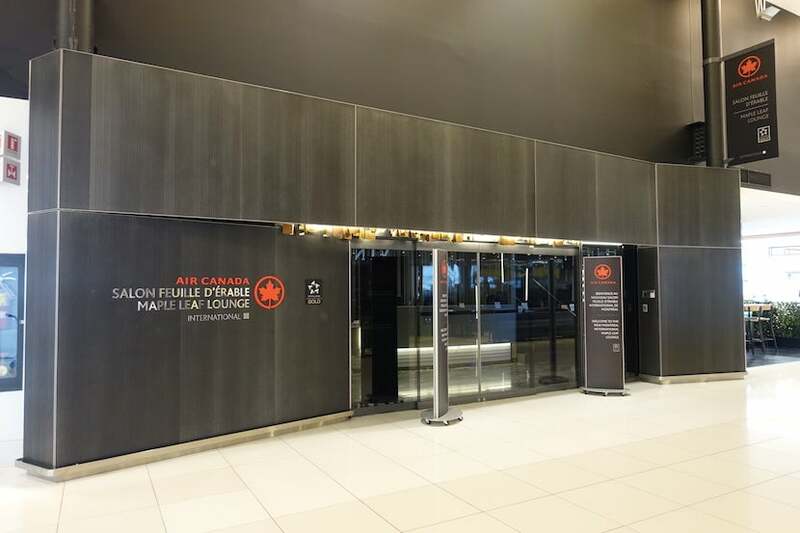 I spent a few minutes strolling around the terminal before heading to the Air Canada Maple Leaf Lounge. 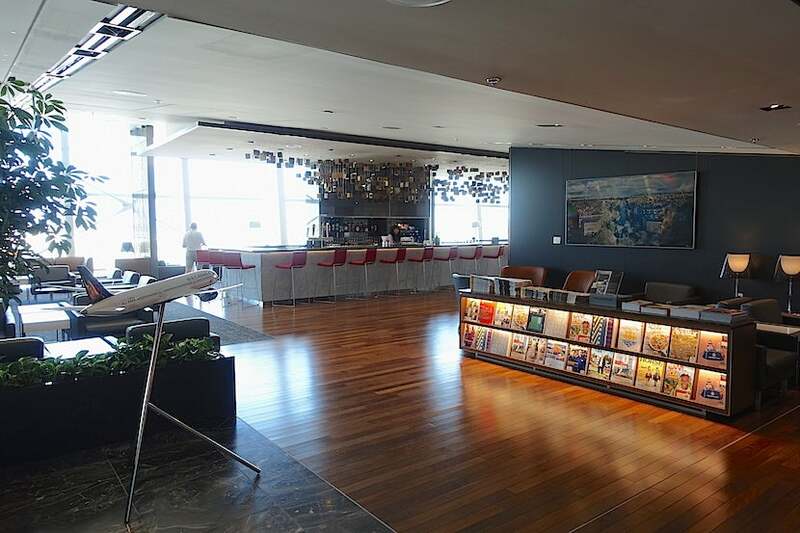 The check-in desk is on the ground floor, but the lounge is one level up via stairs or elevator. While not a huge lounge, it’s comfortable, with a lot of light coming through the windows. A large bar is located near the entrance. Beyond that are the windows and several seating areas with armchairs. Two sections have café-style seating. The buffet is next to the bar and had pizza and other little snacks on offer while I was there. 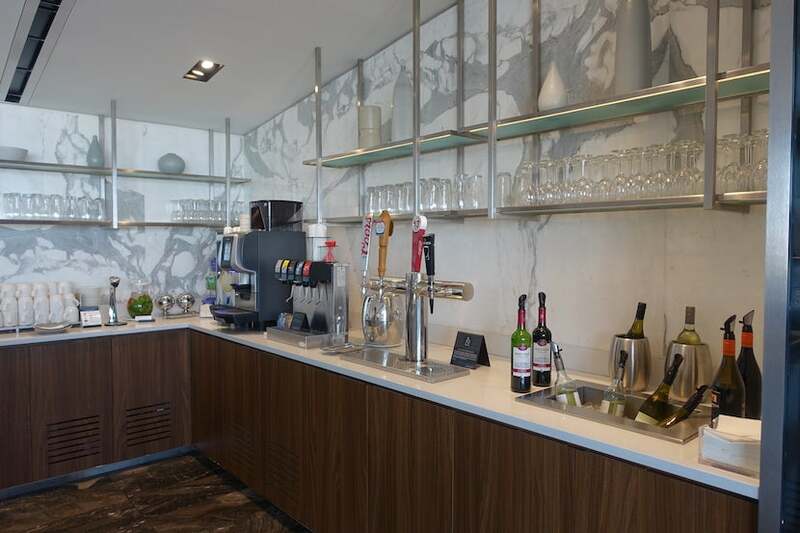 Self-serve beverages including soda, water, beer and wine were available to guests. 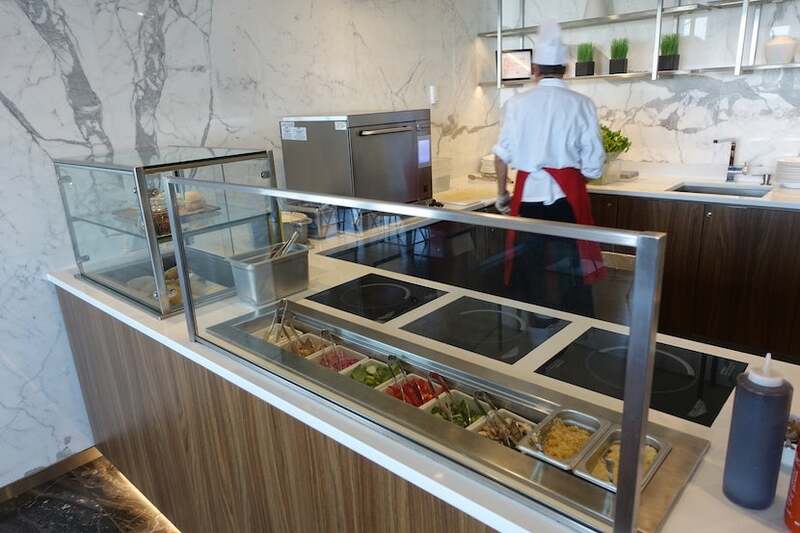 There was also a hot-dish station serving chicken sandwiches. 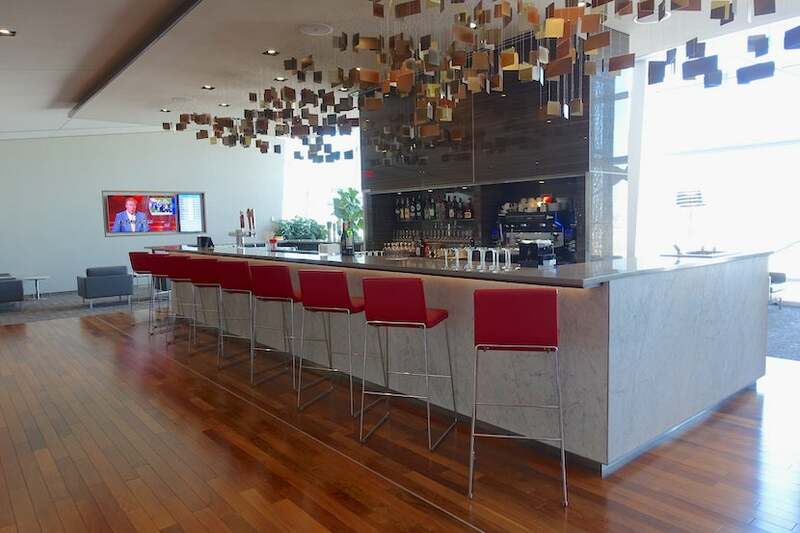 One part of the lounge was roped off when I stopped by, with some more private seating areas and a conference room. 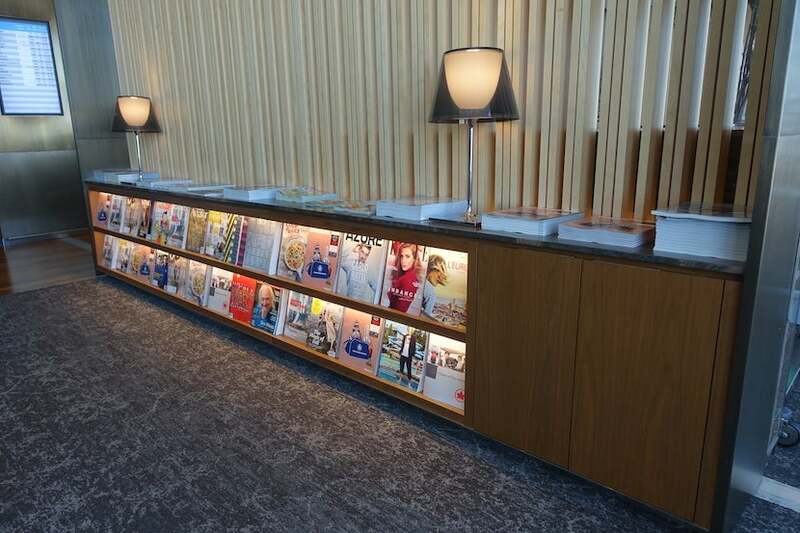 I took a look at the magazines on display before heading back to my seat to send a few last emails before the flight. 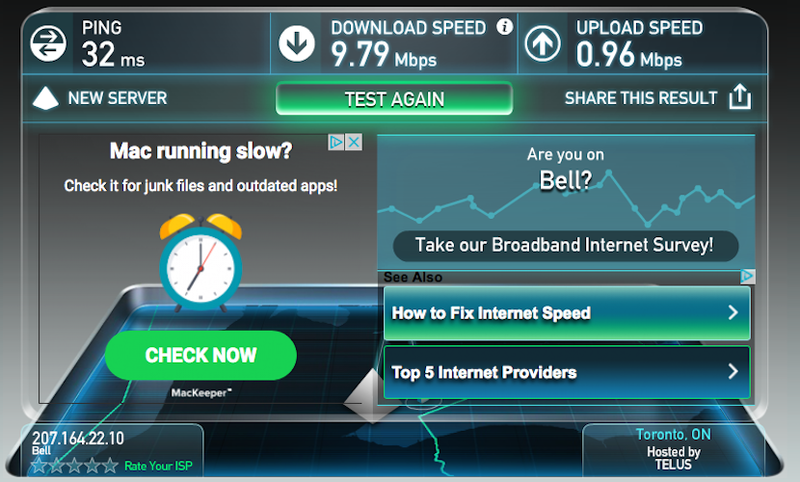 The Wi-Fi speeds in the lounge were okay, at least on the download side. I got some plane-spotting in, too. Check out this A330 pulling into the gate just below the lounge. 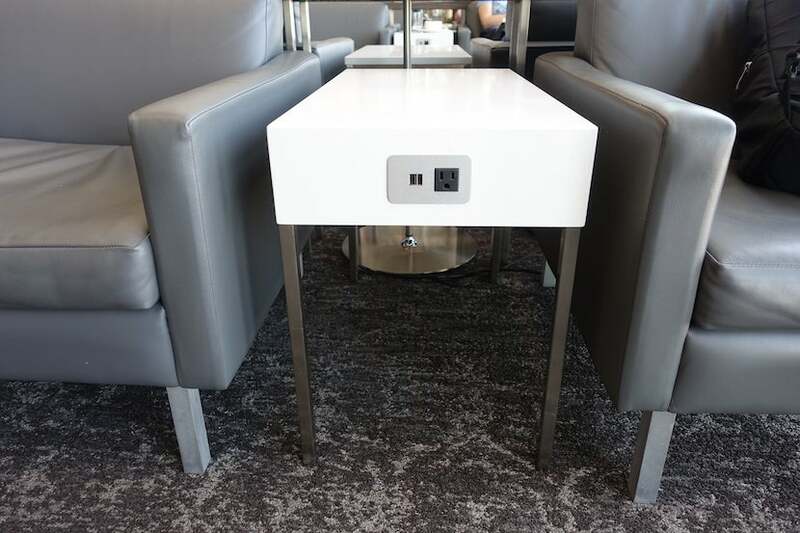 I appreciated how many plugs and outlets there were for charging electronics throughout the lounge. About 50 minutes before my flight, I headed back to the concourse to see if the boarding process had started yet. I got there just as they began boarding business-class passengers and those flying with small children, though folks in the economy cabin had started lining up, too. I boarded through the front door along with the other business passengers and had a look around the cabin. 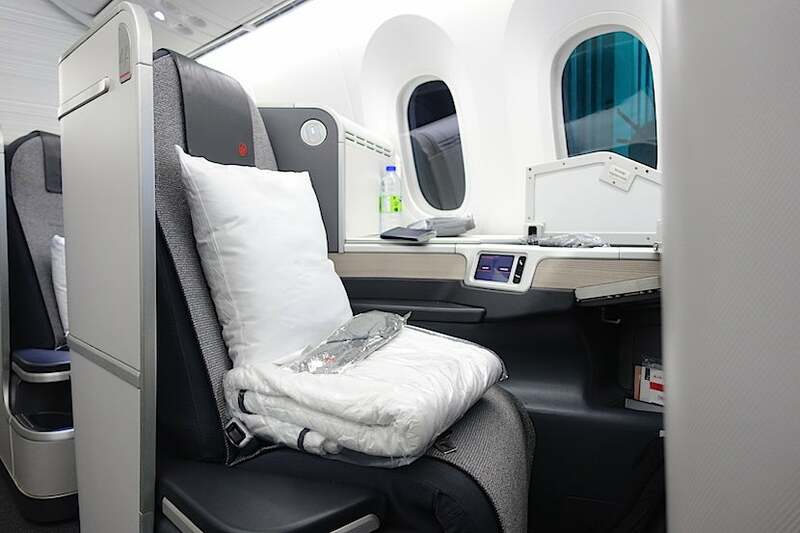 Like Air Canada’s 777-200LRs — which the carrier has been retrofitting — 777-300ERs and 787-9s, the 787-8 has the airline’s newest business-class seats, customized B/E Aerospace Super Diamonds liked you’d find on some of AA’s retrofitted 777-200s and 787-9s, Virgin Australia’s 777-300ERs and most of Qatar Airways’ long-haul fleet. 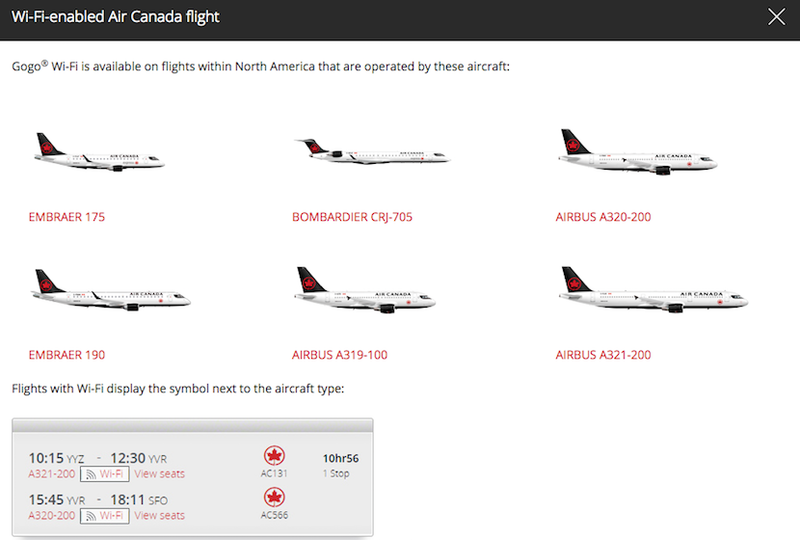 According to Air Canada, the airline currently has eight 787-8s — compared to 21 of its 787-9s currently in service. This one’s tail number was C-GHPT-802, and it’s been flying since June 2014. 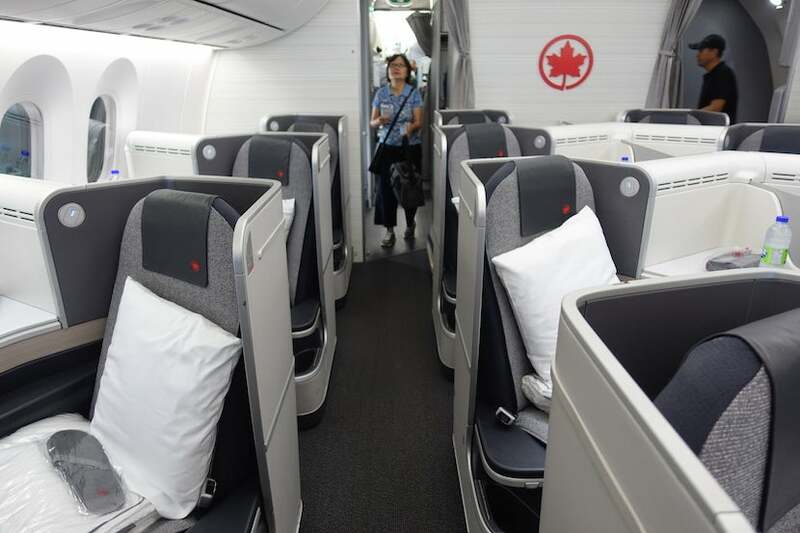 The business-class cabin on this aircraft was much smaller than the one on Air Canada’s other long-haul jets, though. 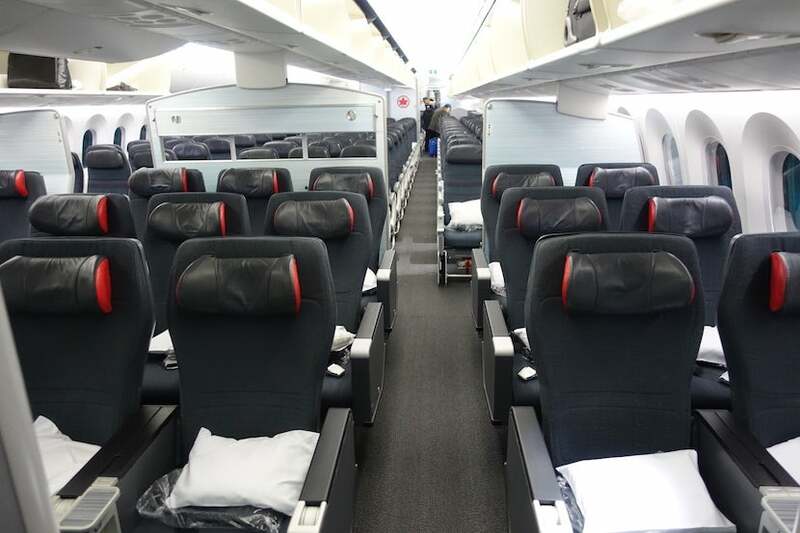 There are just 20 seats compared to the 28-40 on the airline’s two other versions of the 777-300ER and the 30 aboard the 787-9. 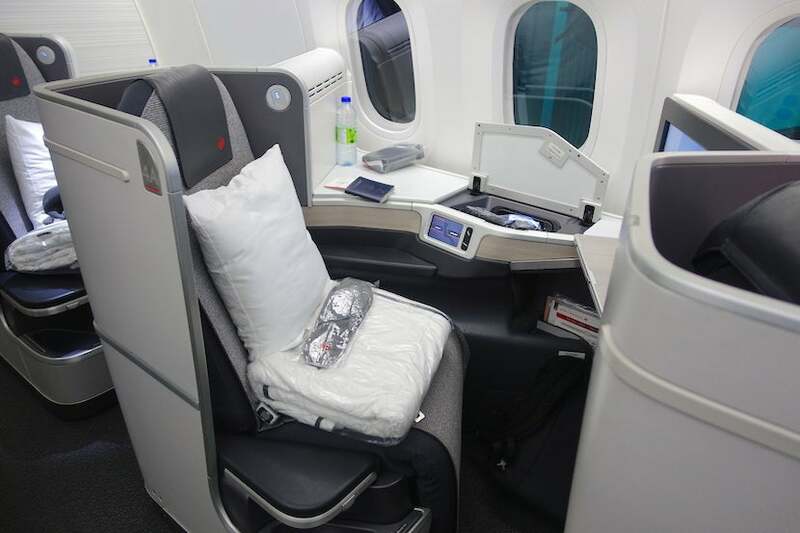 On the 787-8, there’s just a single business-class cabin with five rows of four seats each. The seats are configured in a reverse-herringbone 1-2-1 layout. Each seat is 21 inches wide and reclines to a full length of 80 inches, so it’s a few inches longer than those aboard the 777s. You actually get about five more inches by putting down the thick armrest on the aisle, which is nice for sleeping. I found the seat to be spacious and comfortable with enough privacy thanks to the panels along the aisle. You can adjust both the headset and the lumbar support and turn on a massage function, while the firmness of the mattress can also be tweaked to your liking. 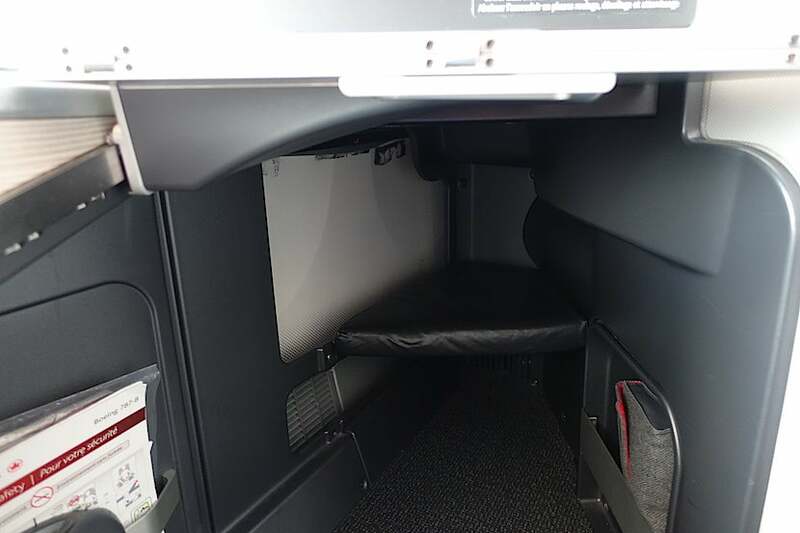 Behind business class is a section with two lavatories and the galley, then a small premium economy cabin with three rows arranged in a 2-3-2 pattern. 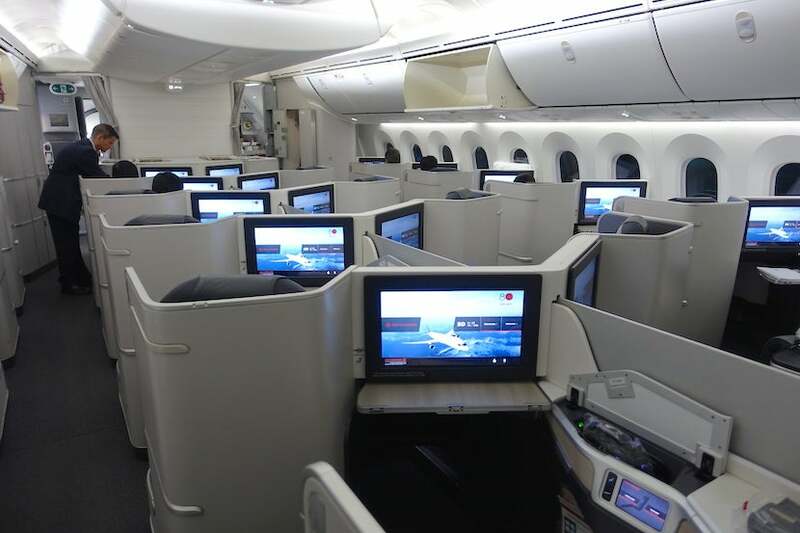 Finally, there are two economy cabins with a total of 210 seats arranged in a tight 3-3-3 configuration. I had automatically been assigned seat 4A, a window seat in the second-to-last row of business class. 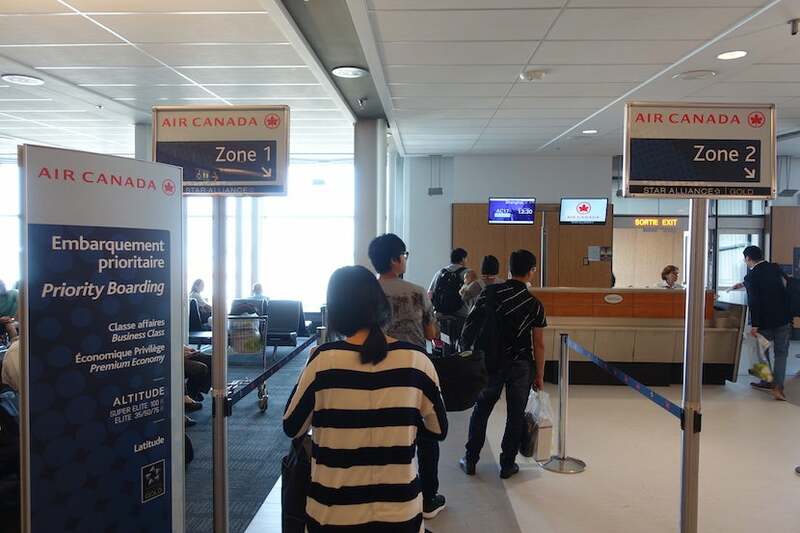 It suited me just fine, so I didn’t bother calling Air Canada to change it — I could not do so online, despite having an Air Canada confirmation number on hand. I was nervous that it would be too close to the aft galley and lavs, but in the end, this wasn’t an issue. 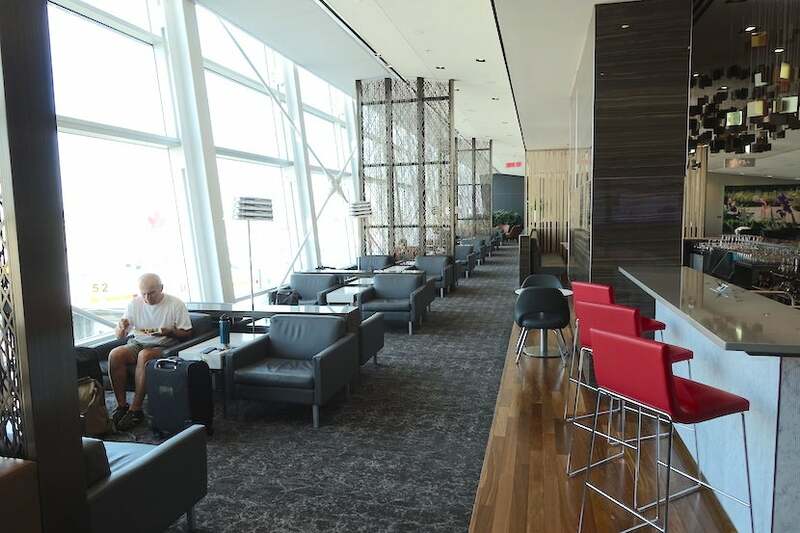 The seats are upholstered in light gray — or is it grey, in Canada? 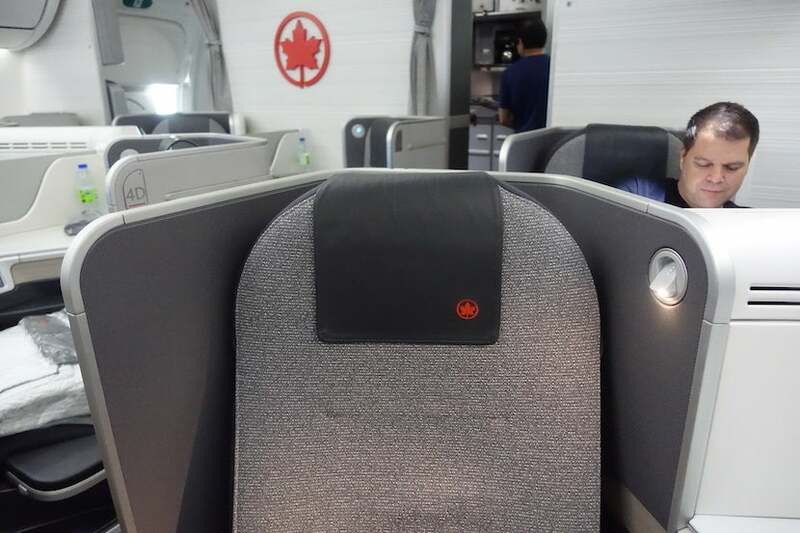 — fabric with black headrest covers. 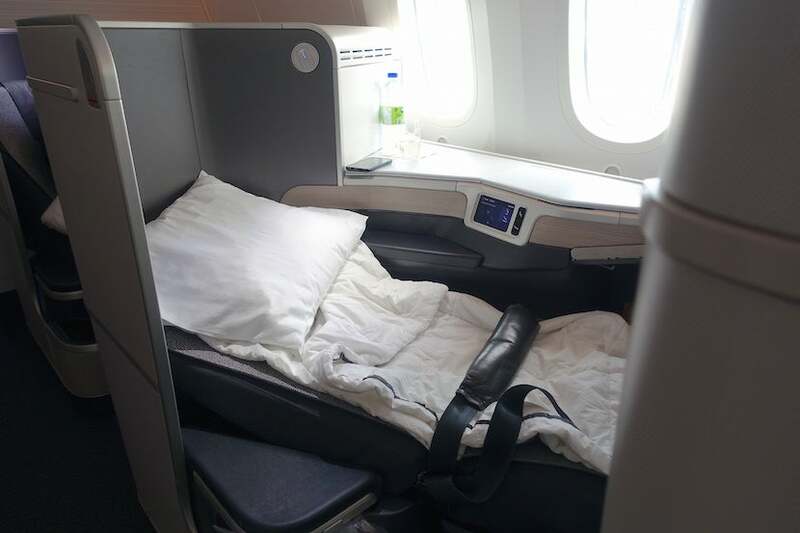 A medium-size pillow and lightweight cotton duvet were waiting on mine when I boarded, along with a pair of gray slippers. The pillow was fine, but I thought the duvet was sort of rough and not too comfortable to sleep with. Alongside the window to the left of my seat was a wide side armrest where I could put my laptop during the flight. Inside the storage cubby in the armrest, I found a plastic-wrapped set of noise-canceling headphones and the touch screen remote for the IFE system. 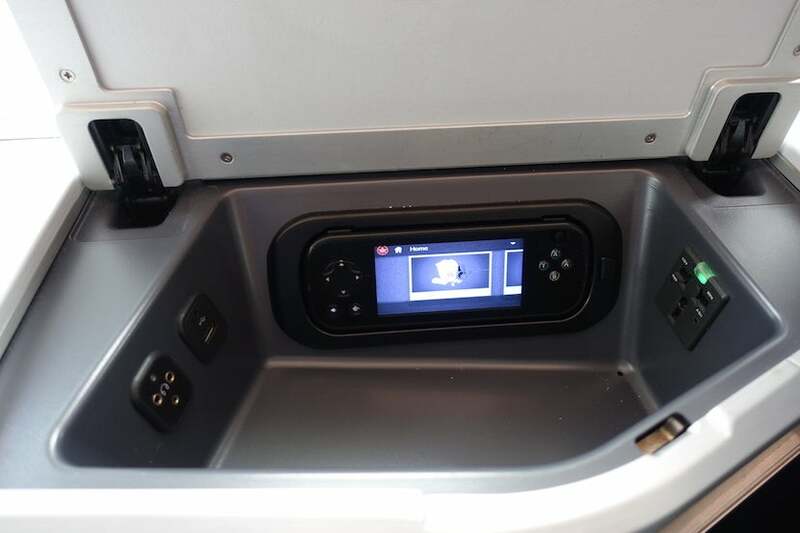 This compartment also contained a universal power outlet, a USB port and the port for the headphones. It was little, but had enough space for me to store my power cords, camera and phone during the flight. I appreciated a little ergonomic piece of design where there was a gap between the cubby cover and the armrest so the cords could come through. 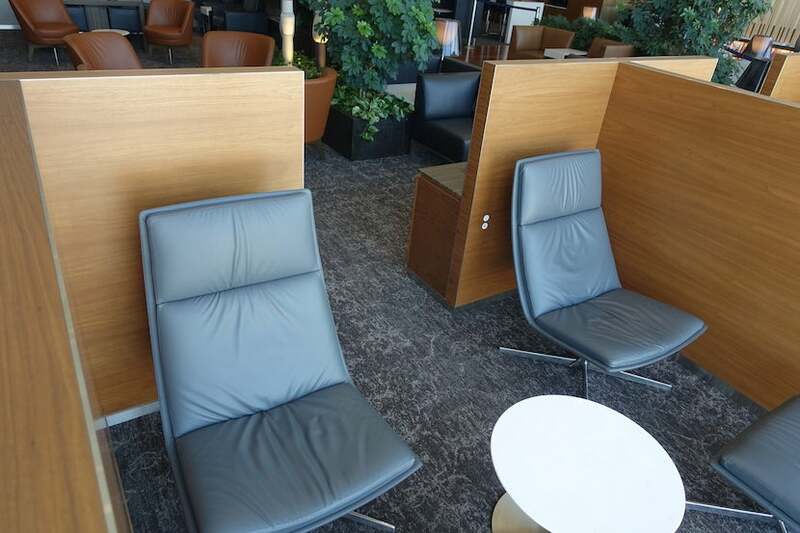 That way, you could plug in your devices and use them at your seat while leaving your cords in the cubby and out of sight. 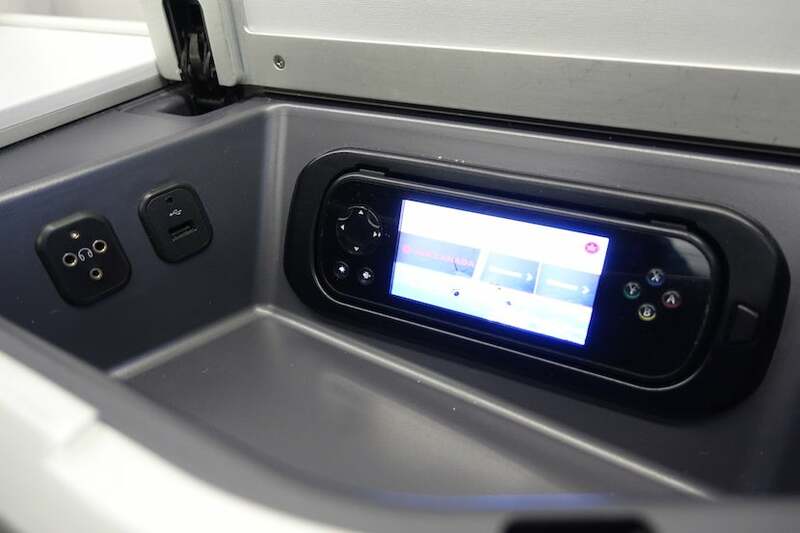 Embedded in the armrest was a small touch screen that controlled the individual parts of the seat. You could use it or actual buttons to select from three pre-set positions: sit, relax and rest. I thought that was rather slick until it malfunctioned — while I was sleeping. The seat seemed to take on a mind of its own and suddenly switched from “rest” back into the upright position, jolting me awake. Then, the control panel didn’t work and I had to find a flight attendant to come reset the entire seat, including the IFE system. The seatbelt was another downside, if you ask me. It is meant to be more comfortable thanks to the thick padding, but in reality, I found it restricted my movement both in the upright and reclined positions. 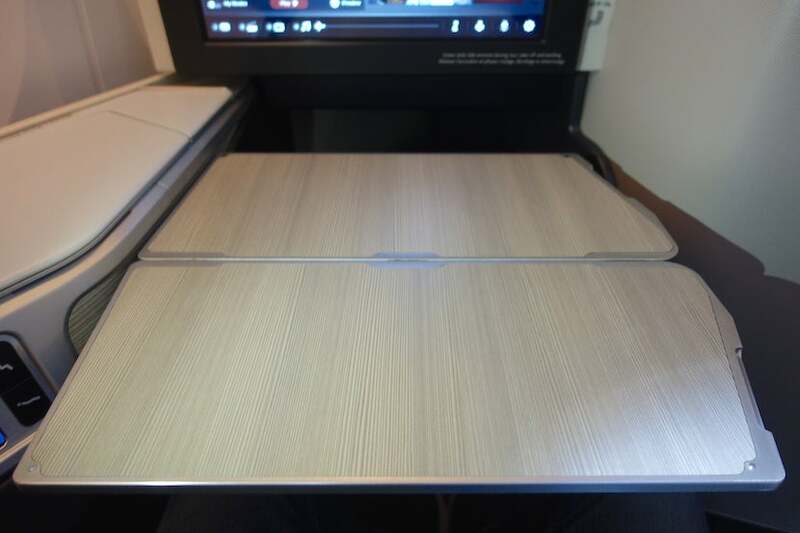 One of the things I liked best about B/E Aerospace’s Super Diamond seats is how ergonomic the tables are — they’re placed underneath the entertainment screens, then can slide forward and fold out to expand if you want to use them for dining or as a work desk. It’s so much easier than having to wrench a table out of a side compartment and slam it back in when you’re done. However, you do feel it when the passenger in the seat behind you unlatches or stows their table tray — it can be loud, so hopefully they won’t want to eat or work while you’re sleeping. 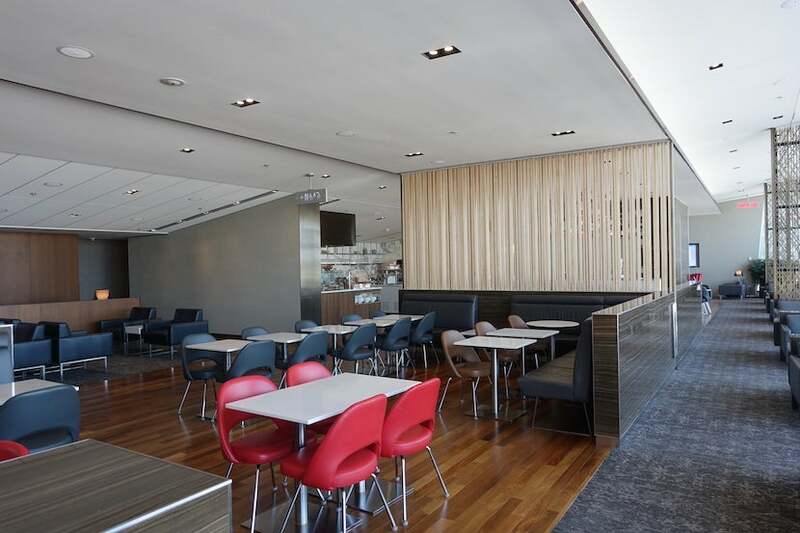 I thought the light finish of the tables, which reflected the airy feel of the cabin overall, was a nice design touch. 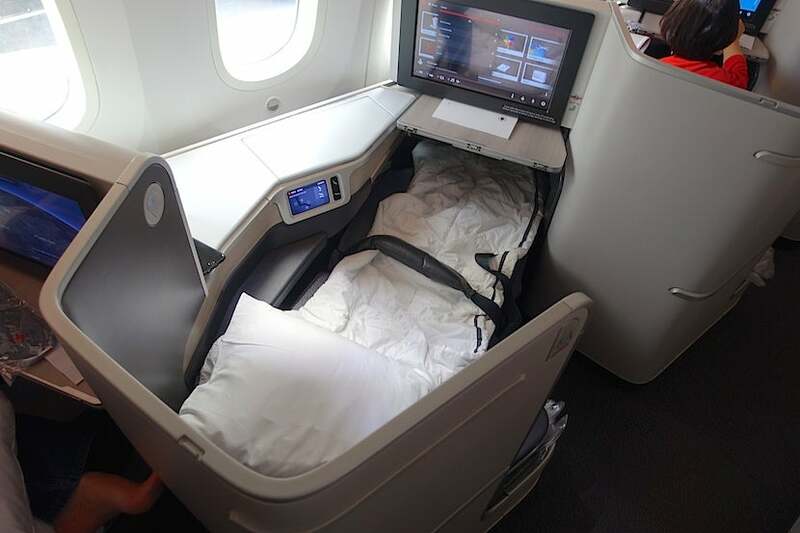 The footwells on these seats are large, making it easier to sleep. 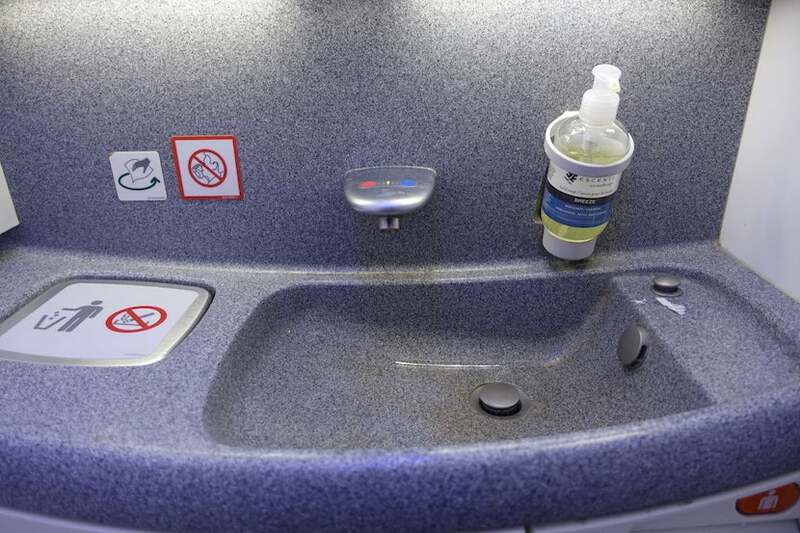 One negative note to share: though the seat seemed clean in general, there were crumbs everywhere — in the seat and along both armrests — and the table was grimy and sticky, so I ended up using my hot towel to wipe everything down. The other drawback? 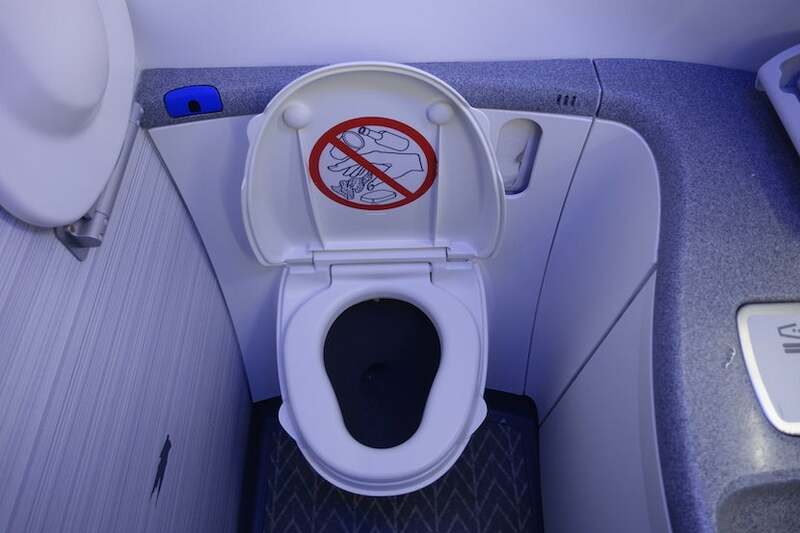 There was only one dedicated business-class lavatory at the front of the cabin, which was busy for long spells of the flight and contributed to congestion up on the forward galley. The rear lavs, however, were shared with premium economy, which meant they were also usually busy. There were Escents products in the bathrooms and I liked the no-touch sink sensors. Unfortunately, the sensors on the toilets didn’t work, so you had to flush them manually. On the plus side, the cabin lighting effects were nice. The crew kept them dimmed for the first portion of the flight and through dinner service and rest time, then gradually raised the light levels starting about two hours before landing. It was sort of like having a miniature interior sunrise. We were flying west and there was full daylight outside for the duration of the flight, so the cabin never got extremely dark. However, it was dark enough to sleep. I could control my two individual windows to keep the shades lightened during meal service, then dim them again while relaxing afterward. All in all, I really liked the ambiance touches of the Dreamliner, and this flight was no exception. 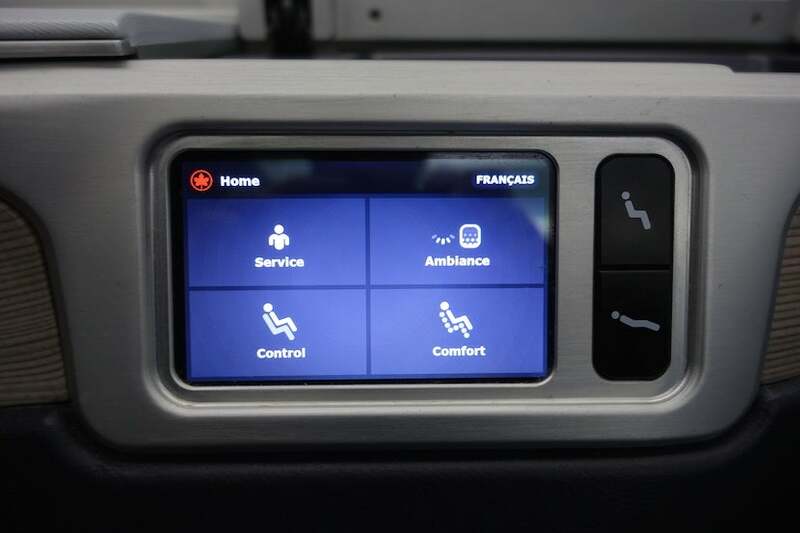 The seats each have their own 18-inch Panasonic eX3 high-definition touch screen entertainment system, which you can control either by touching it or with the remote. I ended up using the touch screen function more, leaving the remote stowed for most of the flight. 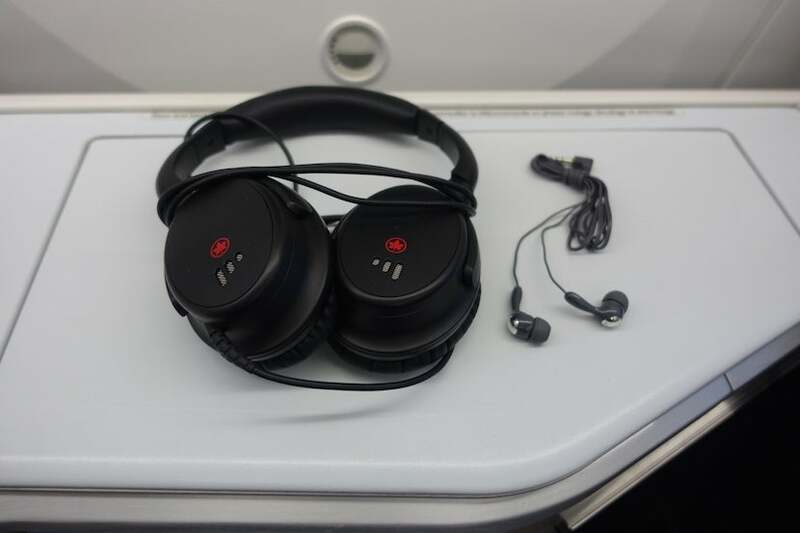 As I mentioned, passengers are given Air Canada noise-canceling headphones, which were okay but not great. For takeoff and landing, we were given regular ear buds to use instead. 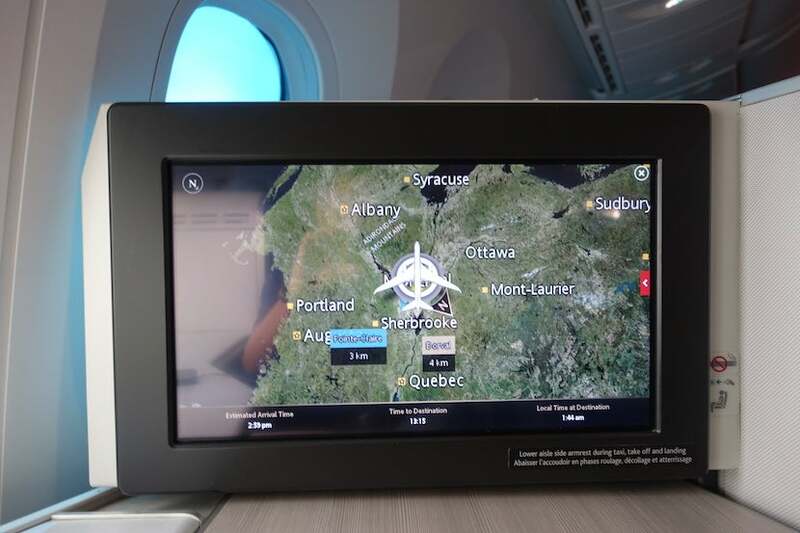 The live map had lots of details and was in high resolution — it changed views and orientation at almost exactly the same time as the plane, which was pretty cool. Though it seemed like you should be able to find the menu through the system, I was not able to do so on this aircraft. However, I could peruse the wine selection. 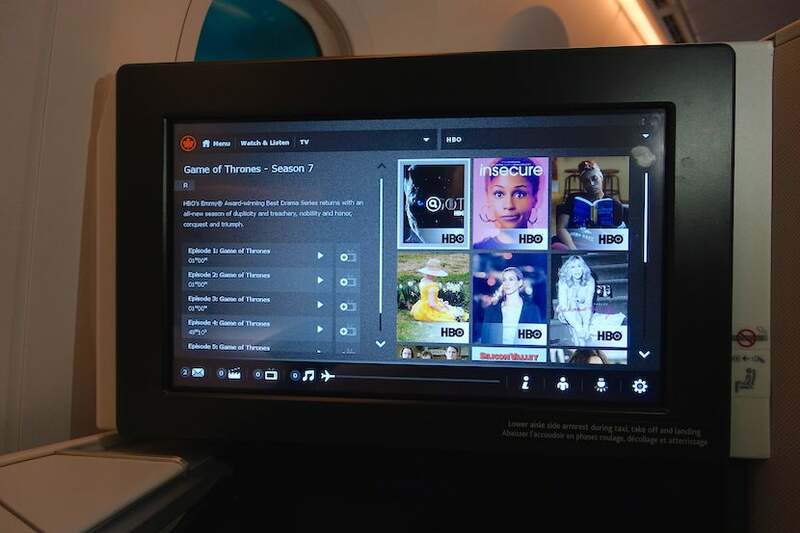 The IFE system had more than 100 movies available, categorized by genre. New releases included titles like The Big Sick and Spiderman Homecoming. There were also plenty of TV options, including a whole section of HBO shows. As you might have guessed already, my main disappointment with this flight was that there was no Wi-Fi. 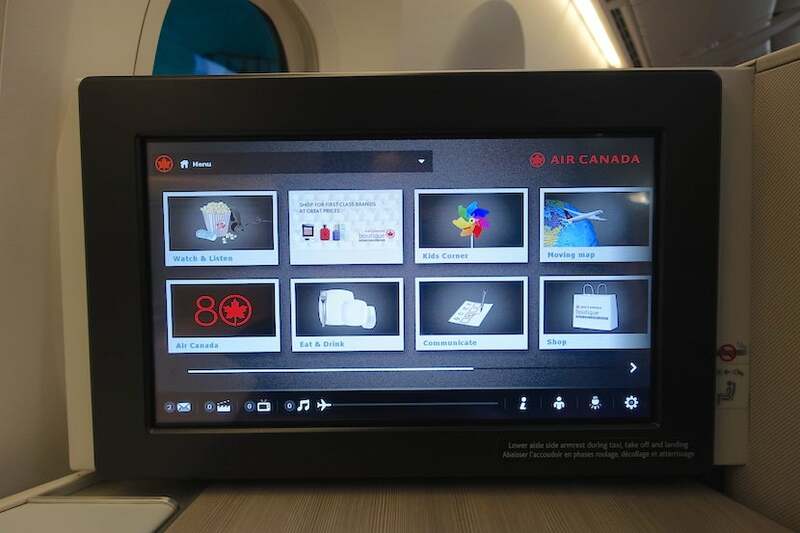 While Air Canada’s short-haul fleet is well-equipped, the airline hasn’t done much to put Wi-Fi on its long-haul jets for some reason. I think that this is probably a big consideration for business travelers who don’t want to be offline for a day, but it wasn’t enough to dissuade me from flying. 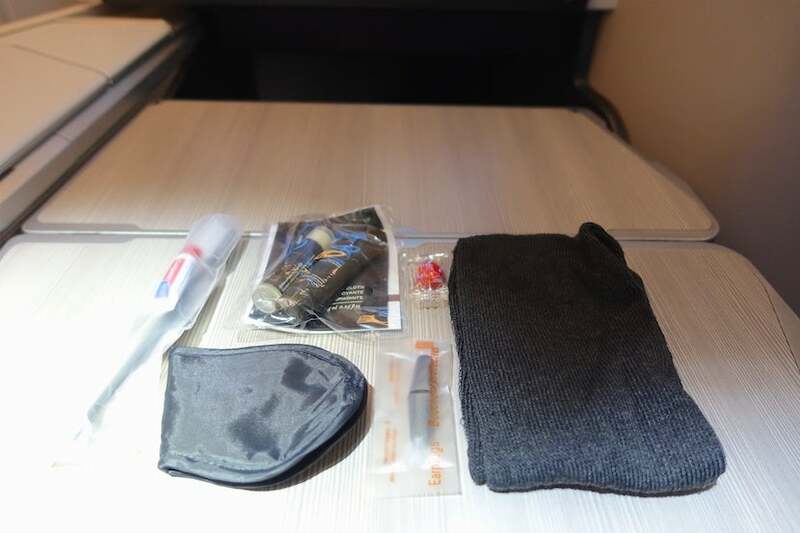 When I got to my seat, I found a small amenity kit waiting for me. Made from felt-like gray tweed, it was not the most attractive kit I’ve seen. 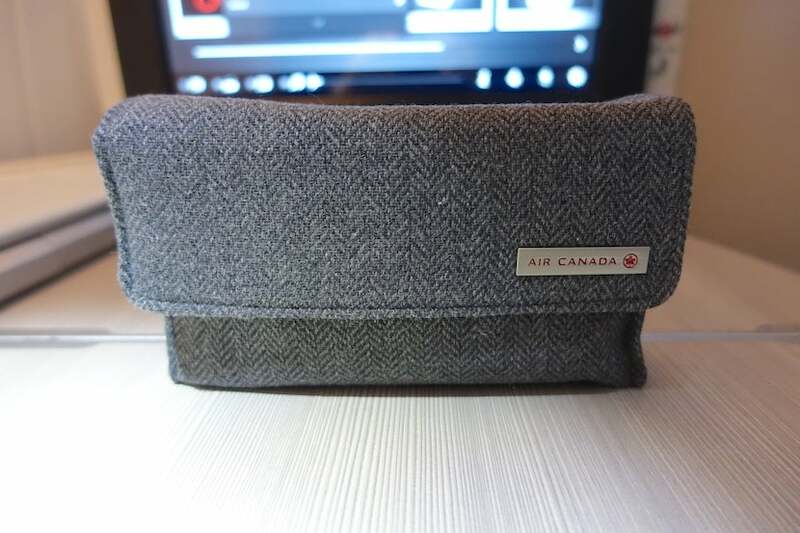 Inside were the usual essentials, like a dental kit, earplugs, socks, an eye mask and skincare products from all-natural Canadian brand Escents. Shortly after I boarded, a flight attendant came by with orange juice, water and some kind of sparkling wine that tasted terrible enough that I asked whether it was the Drappier Champagne I’d seen on the wine list. I was then told we had to wait to open that till we were up in the air, so I just had the water. The purser came by to offer me the menu for the flight, and a couple minutes later, another FA came by to take my order for the main course. 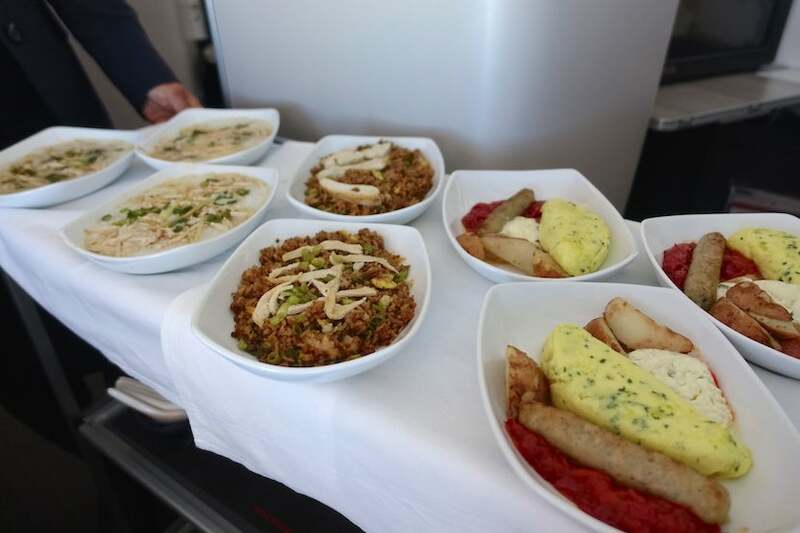 Air Canada works with Vancouver chef David Hawksworth on some of its menus, while sommelier Véronique Rivest oversees the wine selection. There was an express light option for folks looking to eat quickly and get to sleep. Given that the flight was nearly 14 hours and I’d have time to spare, I decided to go for the full meal service. 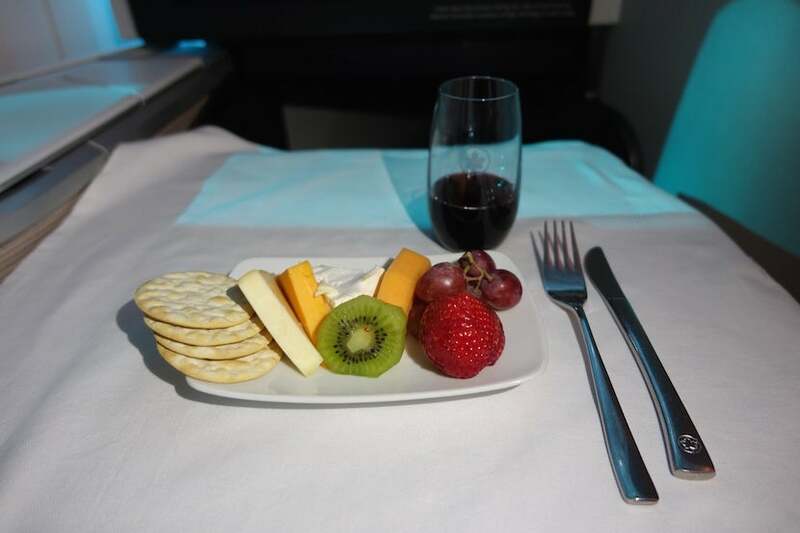 Business-class passengers can also dine on demand and enjoy a main course with a salad, cheese or fruit whenever they like during the flight — the FAs would just need 20-30 minutes of advanced notice to get the meal ready. 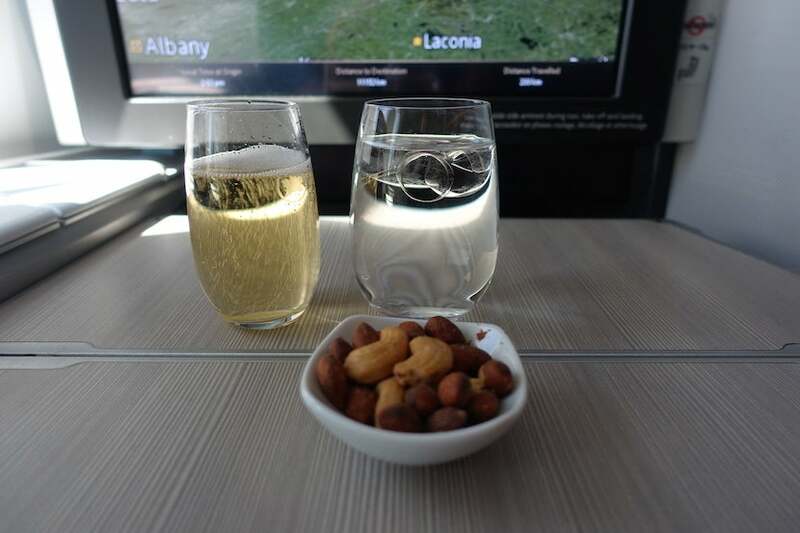 Regular meal service began about 30 minutes into the flight, with a bowl of warm almonds and cashews and a drink of choice. While the Drappier Champagne was much better than what had been served on the ground, I was disappointed to find it wasn’t chilled. The main meal began with an appetizer of poached tiger prawns with marinated artichokes and roasted fennel in a red pepper vinaigrette. 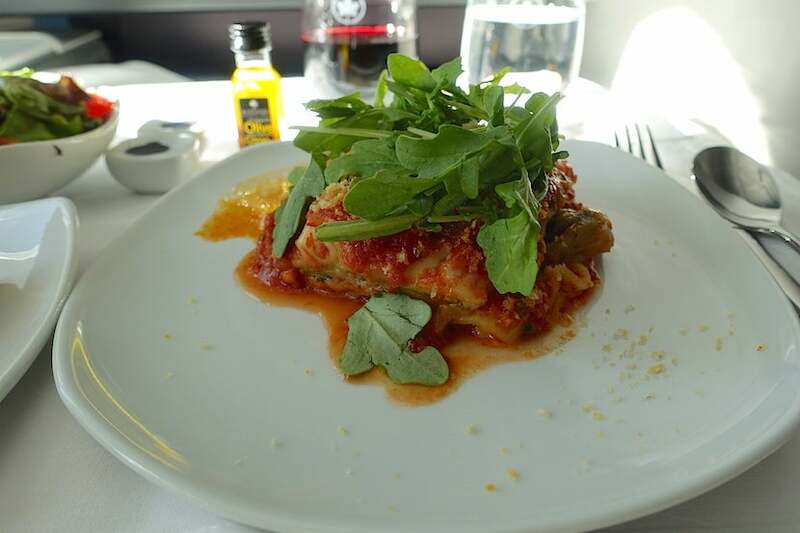 Per the menu key, this was one of the dishes created specifically for the airline and the season by chef Hawksworth. Stir-fried beef with mushrooms, jasmine rice, bok shoy and carrots. 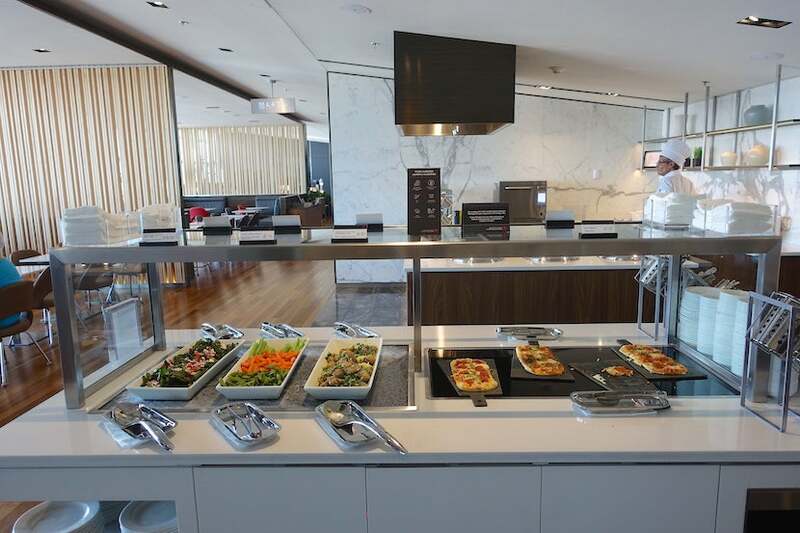 Rustic roasted cod with lemon herb sauce, vegetable quinoa and green beans — this was a healthy option that’s part of Air Canada’s “NutriCuisine” program. Grilled AAA beef tenderloin with Cabernet peppercorn sauce, Yukon Gold mashed potatoes and asparagus. Chef Hawksworth’s grilled eggplant and zucchini lasagna with mozzarella, tomato and basil breadcrumbs. 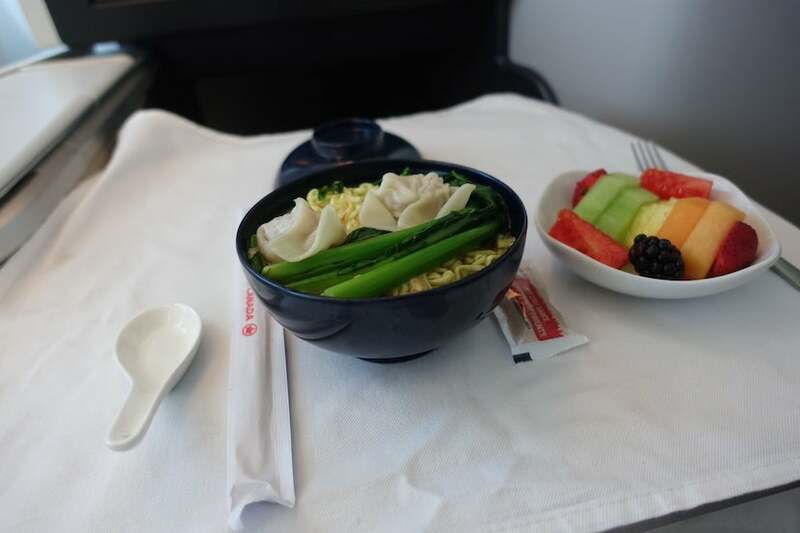 My first choice would have been the beef stir fry since it sounded delicious and like a nice way to get in the mood for my trip to China, but by the time the flight attendant got to me, it was gone. She showed me pictures of the other items, which was helpful, and I decided on the lasagna, which she said she really liked. I had to agree, as it was tasty and light, though not attractively plated. After that came a cheese course with Oka, Camembert, cheddar, crackers and fresh fruit. The cheeses were fine, but all were mild, so it would have been nice to have a little more variety. The fruit was delicious, though. 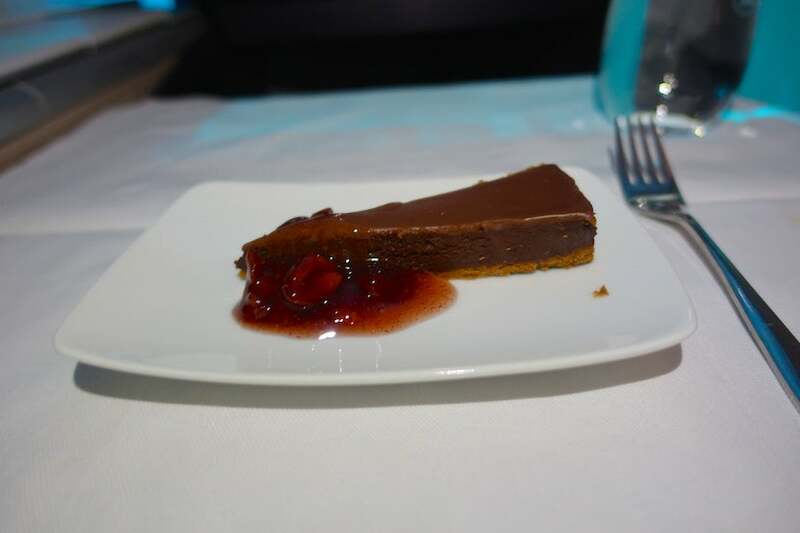 Dessert options included chef Hawksworth’s dark chocolate fondant with hazelnut praline and sun-dried cherry compote or a selection of ice creams. I got the chocolate cake and it was surprisingly delicious — very moist and chocolatey. Champagne Drappier Carte d’Or Brut Champagne from France. Vineland Estates Dry Riesling from the Niagara Escarpment in Canada. Quinta de Saes Reserva white wine from Dão in Portugal. Pittnauer Pitti Zweigelt-Blaufränkisch red blend from Burgenland in Austria. Barbarians Gualtallary Malbec from the Valle de Uco in Argentina. Gérard Bertrand Corbières red blend from Languedoc in France. Dow’s Late Bottle Vintage 2011 Port from Portugal. 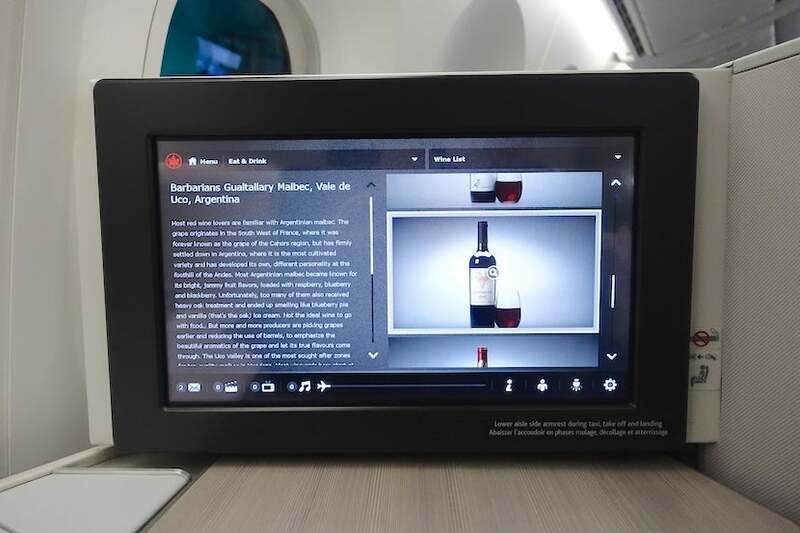 The list was small, but rather eclectic with a wide range of flavors, though some of the obvious typical inclusions from other airline lists, like Chardonnay or Pinot Noir, were missing. I tried the Portuguese white, which had lovely flavors of apricot and almond and went very well with the shrimp appetizer. The Malbec was robust and fruit-forward without being cloying. Hot noodle soup with shrimp and pork wontons and gai-lan. Chili, lime and garlic chicken skewers. Tabouli salad with grilled zucchini and peppers. Dim sum selection of siu mai, har gau and spinach-shrimp dumplings. 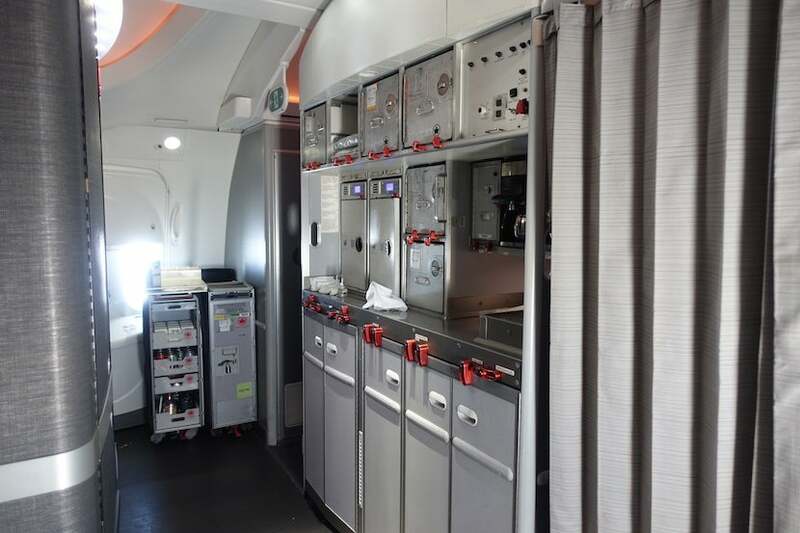 Packaged snacks and fresh fruit in the galley, though in reality, these were set up on the bulkhead and included things like cookies, Kit Kat bars, apples, grapes and bananas. No one was in the aft galley for much of this portion of the flight. In an effort to get onto Shanghai time, I decided against eating between meals and waited for the next service to begin instead. Breakfast service took place about 90 minutes before we landed. 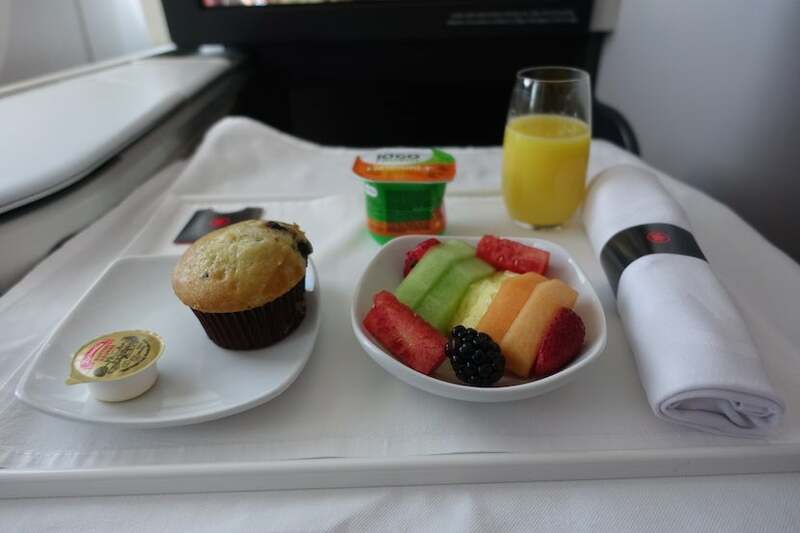 It began with a choice of beverage — orange juice, apple juice tea or coffee — fresh seasonal fruit, yogurt and a pastry basket with croissants and blueberry muffins. Parsley omelette with chicken sausage, roasted red-skin potatoes, red-pepper relish and cottage cheese. Chinese-style congee with chicken julienne, green onion and ginger. Honestly, none of these sounded or looked appetizing, especially that omelette, so I asked if I could have the hot noodle soup from the anytime menu instead. It was sort of like Cup o’ Noodles with some dumplings and bok choy, but hit the spot. 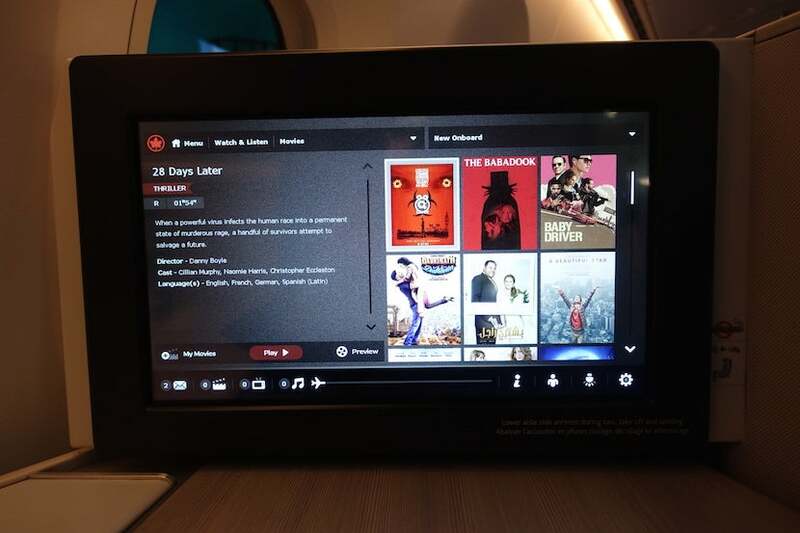 I hadn’t initially thought to fly on Air Canada to Asia, but it turned out to be a great choice for my timing and needs. 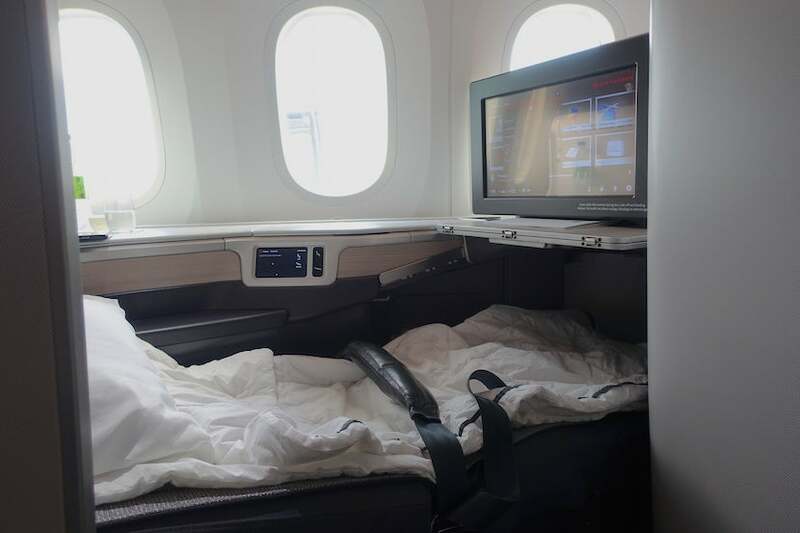 The airline’s updated business-class seats rank high up there with industry favorites like Qatar Airways. If it hadn’t been for that seat control malfunction, the experience would have been unequivocally good. The service was really friendly and professional and the food was surprisingly delicious. 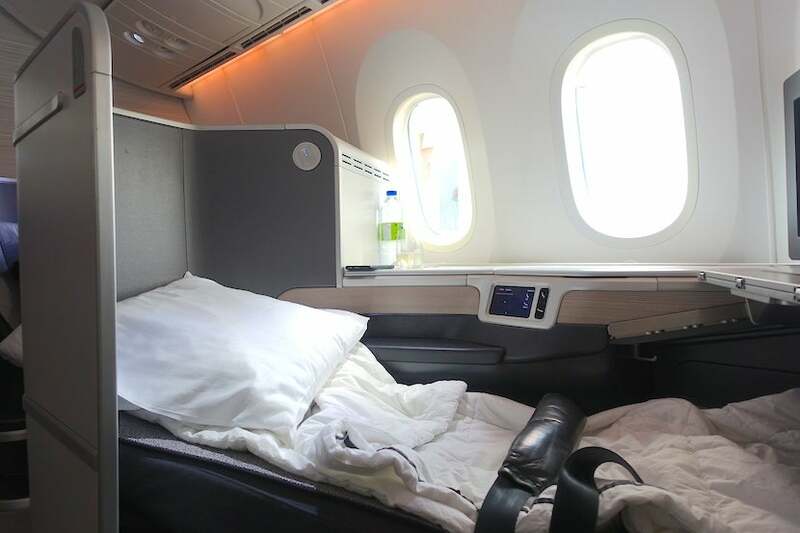 On the downside, the bedding was pretty basic and the amenity kits could stand to be a little more luxurious. 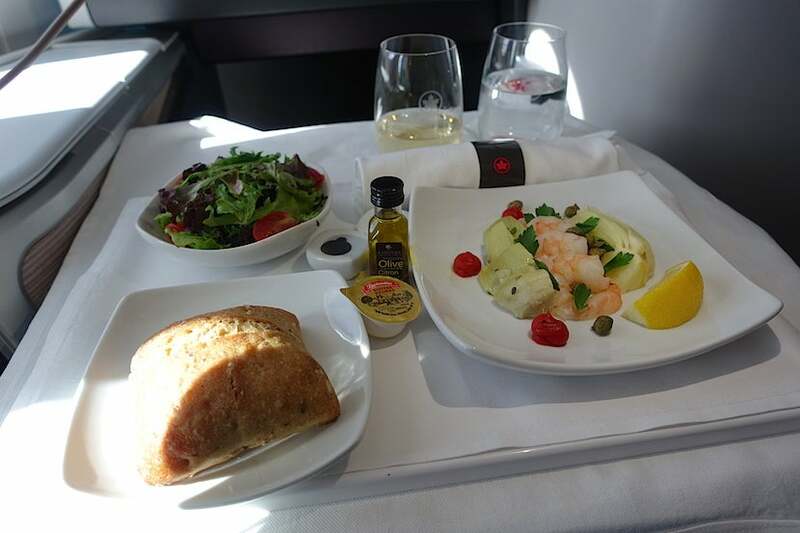 Overall, though, I’d rate my experience highly and wouldn’t hesitate to fly on Air Canada long-haul in the future. 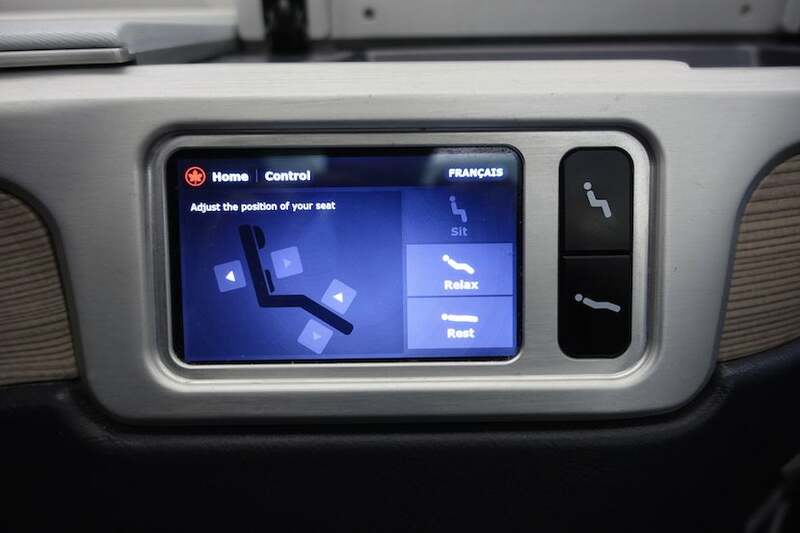 Have you ever flown in business class aboard Air Canada’s Dreamliner? Tell us about your experience, below.